Have you ever dreamed of dining at the “Real Downton Abbey”? Enjoy, entertain, experience! Seek inspiration by enjoying a favourite episode of “Downton Abbey” and gather friends to entertain at a dinner party, lunch, or gala. 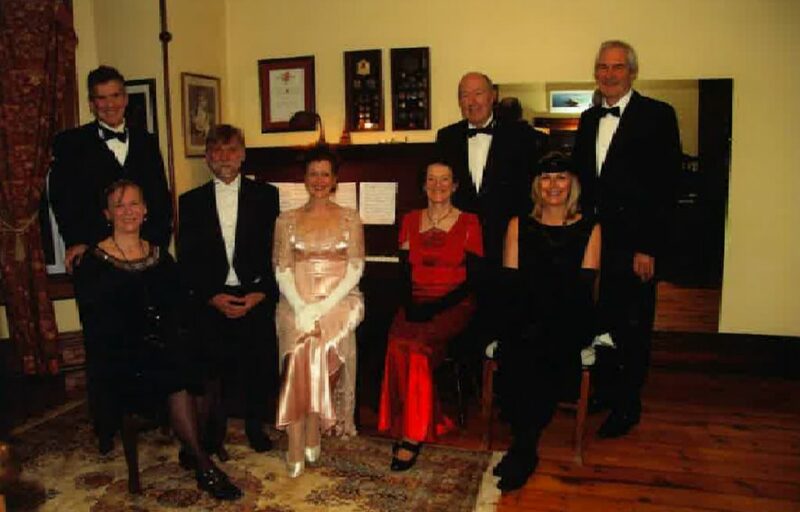 Then send photos and videos of your party for the opportunity to experience the dream dinner party with the Earl and Countess of Carnarvon, here at Highclere Castle. The once in a lifetime opportunity to come and stay in this amazing house for a night will be given to the host of the best dinner party this February, along with their seven chosen guests. You can even use recipes from Lady Carnarvon’s book “At Home at Highclere” as inspiration for your dinner menus and keep an eye open for menu, place card, and invitation templates! As ever our wonderful friends Viking Cruises are supporting us and will sponsor the flights and transport to get here. Your first night will begin at The Vineyard Hotel, an awarding-winning Relais et Chateaux 5 star hotel and will include dinner and a wine tasting. The following day you will arrive at the Castle in time for afternoon tea, to change for dinner, enjoy cocktails and a tour, have dinner and stay the night. The next morning you can enjoy breakfast under the great portrait of Charles I by Sir Anthony van Dyck just like Lord Grantham or in real life just like Lord Salisbury, Sir John A Macdonald, the Prince of Wales or Henry James. 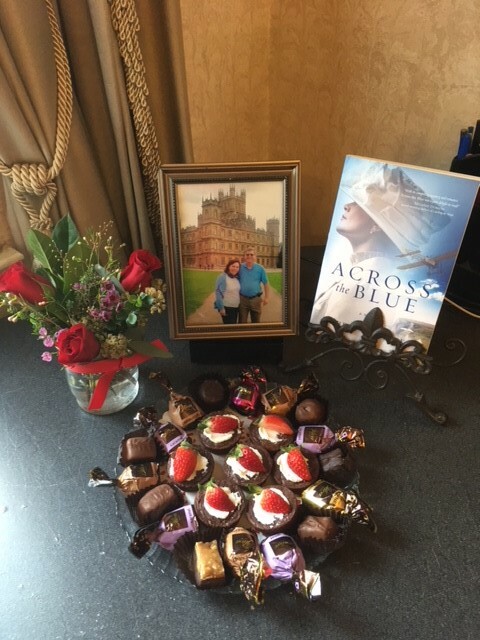 For all involved in “Downton Abbey”, from Highclere Castle to PBS, and indeed its sponsors Viking Cruises, it has been a most fortunate partnership, engaging people in history, heritage, and amazing stories. However, like all great platforms, PBS needs support and this is our way of helping raise money and support. 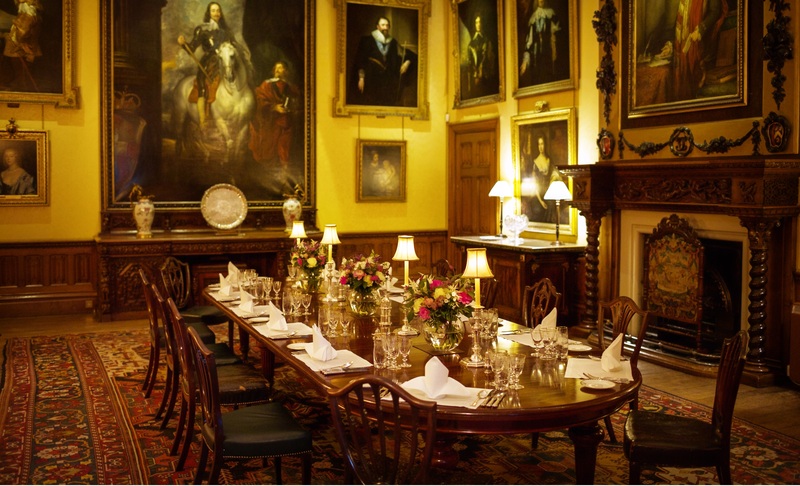 Dine in Highclere’s famous State Dining Room, looking up at the magnificent painting of Charles I on Horseback by Sir Anthony van Dyck. 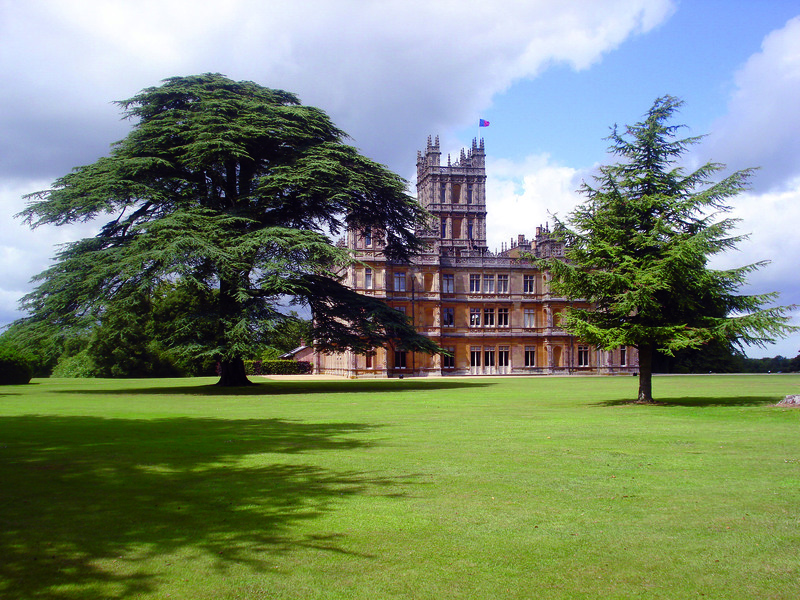 The “Downton” set is actually a real home, my home – Highclere Castle – just as you see it on TV. Highclere Castle enjoy sharing the success of “Downton Abbey”. We would be delighted to welcome four lucky couples to come and stay here with me and my husband, to have dinner in the Dining Room, and breakfast the following morning. Many thanks go to Viking Cruises who have kindly offered return flights from the US/Canada for the winning couples so that you can enjoy the experience in the utmost comfort. To take part, I would love for you to host a dinner party or a gala in February 2018, using recipes from my book “At Home at Highclere, Entertaining at the Real Downton Abbey”. (Available in North America from Rizzoli, Amazon, and all good bookshops.) The choice of recipes is entirely up to you but we will provide some inspiration with menu suggestions, created by our wonderful chef, Paul! We will be posting videos showing how we set the table here and how to cook some of the recipes. In addition, we are creating some items from our gift shop especially for this event. For all involved in “Downton Abbey”, from Highclere Castle to PBS, and indeed its sponsors Viking Cruises, it has been a most fortunate partnership, engaging people in history, heritage, and great stories. Great idea! When more details come out, I'll mention this to my prayer group to see if they want to try this. In Florida we may substitute some sub-tropical dishes to this dinner. Thank you - I could also send you more recipes from here- the 5th Countess's recipe for gnocchi? Or an orange pudding?! Love...love...love this idea! In June, five of my friends and I attended a high tea at a Lavender Farm here in Iowa. I know a dinner party would be so much fun. Not sure if we will invite the spouses, though. It is whatever makes you happy! This sounds fabulous! We so loved Downton Abbey and miss tuning in weekly. The sweeping views and beautiful music just transformed me. Thank you for this possible opportunity of visiting your home. You offered recipes to the poster above...I would be thrilled. I am just thinking I would like to propose recipes and then put them on menu cards - really smart! Lovely idea for our anniversary in February! Thank-you. Marvellous - here is to PBS - great channel! Thank you for the first-rate inspiration. My Downton Abbey class and I will most likely fill the bill with food, drink and Downton abbey attire. Will we get points off for simplifying recipes? Love the idea of dressing up and all but the drudgery of preparing anyone's great grandmother recipes sounds dismal and time consuming. And of course few of us in America, as in Modern Day England, have the requisite staff, to quite pull this off with panache and grace! I love a reason to gather my friends together for good food and wine. Thank you, Lady Carnarvon, for suggesting this. Now to begin the creative juices and start cooking a delicious meal using the recipes from your book and blog. Just finished reading Lady Almina and the Real Downton Abbey. Great read. Thank you - Almina appears in At Home as well - and her marriage contract! Great idea. I proposed to my fiancé at Highclere in 2016 on the stop where Matthew proposed to lady Mary. Would love to do this for her. Lord and Lady Carnarvon, thank you for providing this opportunity. Such a celebration of grace and beauty would be a dream come true! Lady Carnavon, I would be honored to be chosen to attend a dinner and breakfast at Highclere. Your competition is such a lovely idea. Downton was such a delight and I already do everything I can to make it last longer: tea by the fire, making scones, formal dinner parties. My friend visited Highclere last summer and said she thought of me the whole time as I would have loved it so much. You can be sure I will enter your competition. Thank you for keeping Downton alive. I thought it would be fun - I am grateful for PBS and think it has been a good partnership! Please spread the word! My husband gave me the book (in German) for Christmas. I will definitely be interested in more details of the competition. :-) It is a lovely book I can highly recommend! Thank you ! We will bring it all together in the NEw Year! My husband and I are delighted to read about this unique opportunity to experience for a short time the life at your wonderful residence. He gifted me last July with a super surprise visit to Highclare Castle. It has been one of his wedding presents to me to recall the very english style of our wedding (we married the previous October). We would be immensely happy to have the chance to be among the lucky 8 so we will participate for sure to the competition. we visited your home in June 2016 because we love Downton Abbey. My husband gave me your latest book in German with the recipes. Some of them are familiar to me because my mother cooked them. I will be pleased to give a dinner at the occasion of my birthday on 26 January 2018 and cook some recipes of this lovely book. Would it be possible to send me the conditions of this competition, so I can prepare myself. I wish you and everybody at Highclere Castle all the best and a happy New Year. is the competion also open to people from Europe? We are from Belgium and are also very interested in organizing a Downton-style dinner to participate in the competition... I hope it is possible. Hello Luc - yes it is open to all! I couldn't believe my eyes when I read your generous and lovely contest! As a superfan across the pond, I fangirl everything Highclere!!! I am savoring EVERY page of At Home at Highclere and am so excited to try the recipes which are beautifully laid out and made very simple to understand! 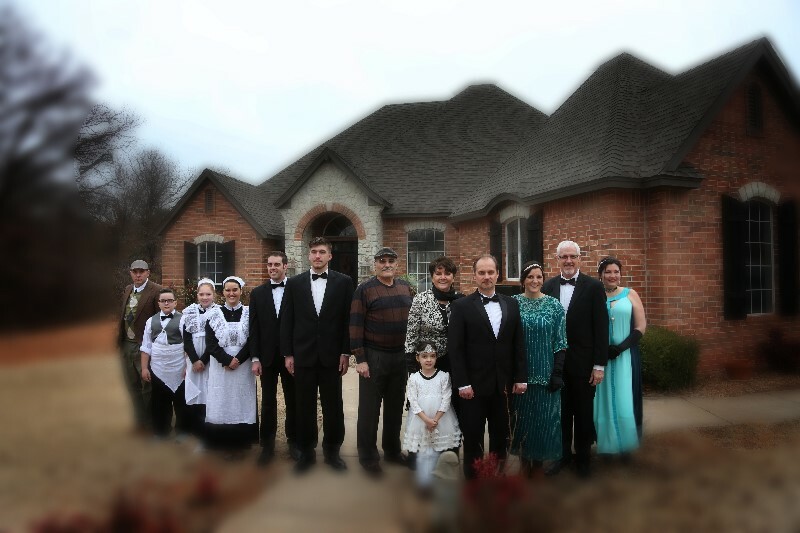 My daughter threw me a Downton Birthday party a few years ago and it was one of my most favorite birthday to date! SO of course I can't wait to host a dinner party in my home with my of superfan friends! 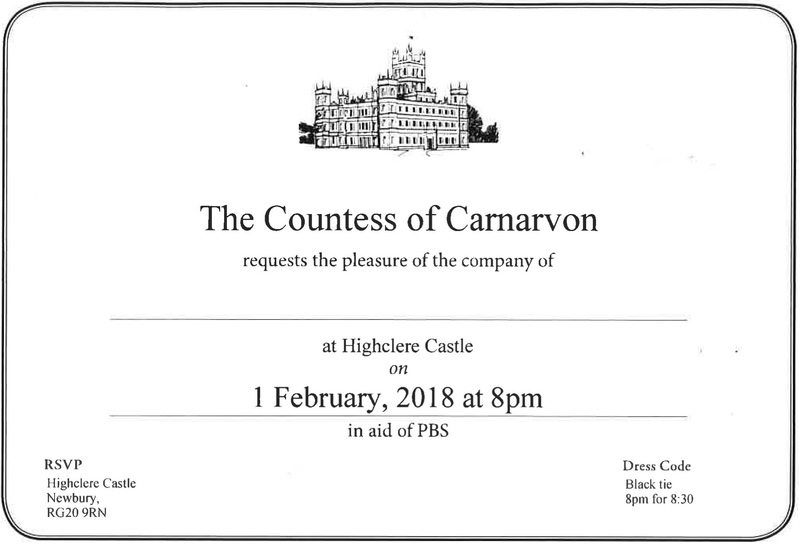 Thank you sooo sooo much Lady Carnarvon for this wonderful idea and opportunity to support PBS and have fun! Then you are en route for another birthday dinner Downton party!!! You have had some practice.I have just been making a little video about making chocolate post as one idea (they can be done a couple of days in advance).. PBS is a unique platform. Equally I am hoping we will ave some participants from Germany or the UK too!!! What a fantastic idea! This combines three of my favorite things...friends, food, and "Downton Abbey!" My husband and I are currently housesitting our way through Europe, so our dinner party might take a little more ingenuity, but I am looking forward to the challenge. Thank you for your spirit of generosity and hospitality! Oh, My Goodness!!! This is a generous offer from you and your husband and an exciting opportunity for a few lucky Downton Abbey Fans!!! I love how you have paired this competition with a fundraising effort for PBS! I keep waiting for Queen Victoria from PBS' "Victoria" to show up for a visit to Highclere Castle!!! EXCITING!!! Thanks! panelled dinning room. What fun we shall have dressing up and having a jolly evening, even if we don't win! How lovely it sounds beautiful - I love oak! I do - it is in the "At Home" book and I can retrieve it from there - where are you in the World - the US version has "cups" ectc!! I am having so much fun - creating my guest list, then using your invitation templates, and watching the videos. I am choosing recipes from your "At Home at Highclere" book now. You graciously signed the books for my mother and myself when we were guests on the Special Tour of Highclere - June 3, 2017. It was such a marvelous day - a day we will never forget. Would it be possible to combine a Viking Cruise to either end of the trip understanding that the cost would be ours? If we won, the travel time from/to NW Montana would make it advantageous to extend the visit.....and what a truly great time would be had! I'm already having a fine time planning our feast. This is what you were telling me about when I met you in December when you hosted the Christmas Fair, this is fabulous, and for a great cause, we love PBS. I am sure we can drum up something in Naples. My friends loved their books, thank you so much my dear. Happy Dining !!! You should open this up to dinner parties not just from the month of February, I have incredible photos from a Downton Themed dinner party I did to watch the finale. My friends and family even dressed up and my son played footman! This would definitely be a bucket list item for my husband and I! We have dreamed of visiting Highclere and England ever since we fell in love with Downton Abbey, I think it was Series 1, Episode 2!! So much pressure now to try and do something fancy enough to catch your eye! Lady Carnarvon, John Baker here from Princeton, NJ. We have corresponded some years ago about your Steinway after I watched your tour of the castle on PBS. The dining invitation is such a fabulous idea! My wife and I recently went to the Downton Abbey exhibit in New York City, where the exhibit’s store sells wonderful books on Highclere. Some day we will come to Highclere for the tour, as I have also realized this past year that my great uncle, “Egyptologist/Acheologist” Theodore M. Davis, had all of his digs in the Valley of the Kings funded through the patronage of Lord Carnarvon (your great grandfather by marriage?) from 1885-1910. I put his title in quotes as some experts in that field have other not so kind descriptions of my great uncle’s efforts! I do hope I will have the honor of meeting you some day. What a fabulous idea! I live in Fullerton, CA but were lucky enough to attend your special invitation tour and tea last June 3rd with my 18 year old daughter and husband. My daughter loves english history so found the tour so fascinating. You were so gracious, letting us meet your dogs and signing your book. We have tried recreating some of the recipes in the book, but have not mastered the carrot, coriander, ginger & coconut soup that was so amazing on that cold morning. Any recipes you can share to use at our event would be greatly appreciated! Oh, my! How exciting! We live in Florida, so it will require a different setting for us. Does it matter how many guests we have? We have only lived here a short time and we don't know very many people. But I am a huge Downton Abbey fan! It would be amazing to win for our 51st Anniversary in March! Thank you so much for doing this. Today is Valentines' Day. On my Husband's card I borrowed a line from Matthew..."I will love you until the last breath leaves my body". I've watched the entire 6 seasons at least 20 times! My wife and I had the privilege of visiting Highclere Castle. We hope to return at some point in the future. However, we would both love to see a special event with Downton Abbey cast members presence highlighting the event. What a special treat that would be and what a great way to generate exceptional interest and revenue. 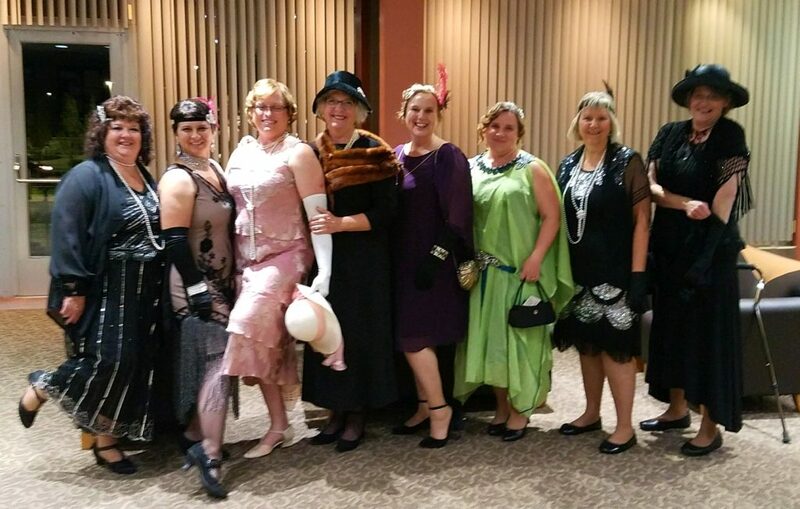 My wife and I attended a Downton Abbey party in January of 2016 along with 10 others. We were in period dress, had Downton Abbey pictures streaming, and enjoyed a proper tea. Later that year I took my wife to England primarily to visit Highclere. We had a wonderful tea there. Our tour of the castle brought back so many memories of people and events from the series. I do wish, though, that we could have taken photos. I am glad you had a nice time! While I have thoroughly enjoyed your website and blogs highlighting life inside Highclere Castle, I was amazed to discover that Highclere is STILL a working farm as well! I very much enjoyed: the Harvester Combine, the barn, the horses and newborn lamb videos! As a girl growing up in Kansas, I spent many summers on and around our combine; helping my dad harvest wheat. While we never raised lambs, I am very familiar with horses, cows, pigs and chickens. If I am lucky enough to be chosen as one of the winners of your contest, do you think it might be possible for my guests and myself to see a bit of the farm as well? I live in a condo now, but, I am still a country girl at heart! I would love to show you the farm! I live way out in the country but have invited 3 dear friends to a fundraiser luncheon at my home this Saturday at noon. It isn’t much, but our love for all of PBS creations is greater! I look forward to submitting our photos and sharing our little gathering! Wonderful - I look forward to seeing it! in episodes of our beloved Downton Abby series. It was the most successful event of our season! e-mail pictures, not insert them into this format. at Highclere on May 25 of this year (2018). your experiences and plans for keeping Highclere prosperous and relevant. That is wonderful and I hope when we create another Come and Dine you will all join in. Perhaps we can suggest a summer reception for the winning Gala dinner! As you may well know Highclere Castle has a very strong link to Egypt, and particularly Tutankhamun. In 1922 the 5th Earl of Carnarvon and Howard Carter discovered the the ancient tomb, which would truly captured the world’s imagination over 50 years later. 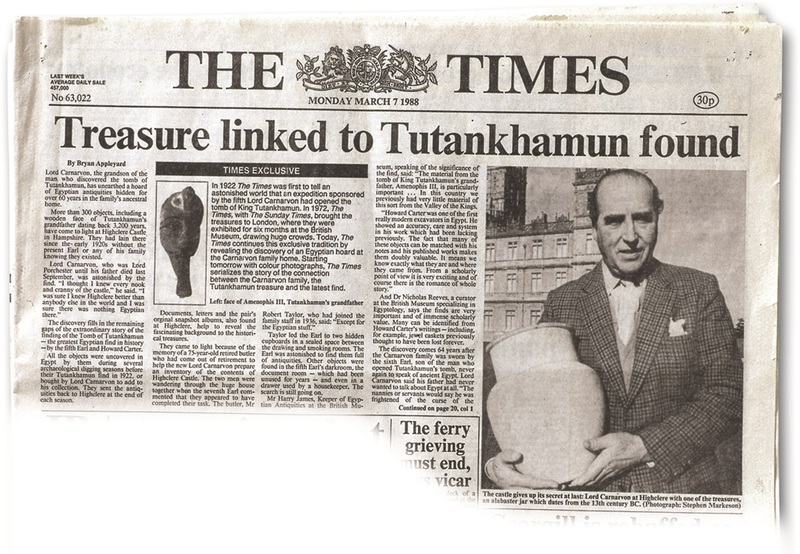 The Tutankhamun exhibition is the most successful in the British Museum’s history, with 1.6 million people visiting in 1972 and could be considered the first global world media event. It was, and is, a marvellous story about treasure, tragedy and of course, a curse. Despite the significance of the discovery, the first biography of Howard Carter was not written until 1972! Egypt has been in our hearts at Highclere for so long and it is wonderful to be able to share this small piece of history with so many people. 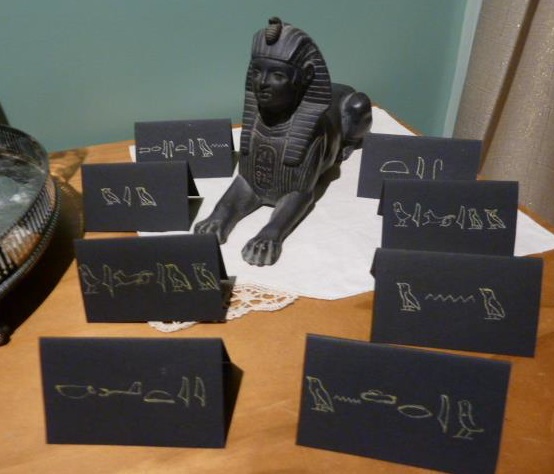 It might be fun to incorporate an Egyptian aspect into your dinner parties, with hieroglyphs making a perfect addition to your table place cards. Writing them in hieroglyphs will be excellent talking point, or you could perhaps allow guests to add their name in Ancient Egyptian script when they arrive. We have provided a helpful guide to take you through, step by step, the process of translating your name into hieroglyphs. It might be of interest to have some background about the use of hieroglyphs and how they are read. Traditionally they were read from right to left or top to bottom, but for ease of translation into Latin scripts we can read them from left to right. It is easy to identify the direction of reading by noticing the direction that the humans and animals are facing – if they are facing left, then the hieroglyphs are read from left to right. It is such a pleasure to be able to wish you a Happy New Year, 2018 has just begun, and what a wonderful time to start thinking about what the coming year holds. We have a truly exciting January planned for those who are waiting in anticipation of “Come and Dine”. You can look forward to video releases and more content to help you organise your perfect dinner party during February while aiming to raise money for charity. Please return to the Community page each week during January where there will be plenty to keep your imagination fresh as you prepare for your dinner parties. Then, in February, as we receive entries you will be able to get a glimpse of the other wonderful parties people are hosting around the world! If you have any questions, or want to let us know your thoughts, please comment below and engage with us as a community. We would love to see your progress, so any of photos as you prepare or practice in readiness for February should be sent to the “Come and Dine” email. What a beautiful table! May I ask where I could locate your table candle lamps from, or something similar? They really do compliment the table so well! I have just read your req. for the Gala Affair, and may I suggest a thought. Please remind all of the applicants to be sure that there Passports are valid, and up to date. Sense this dinner is for anyone in the world, it would be terrible, for someone to win, and not have a passport, and there guest as well to get to England on time! Just a suggestion, sense your following in international, it would terrible, that at the last minute, you find out that you, and som of your guests passport is out dated. I am so glad to see you are still supporting the Downton Abbey aura. I did a good deal of reading about the era as well as enjoyed your books - just need to procure the latest. I hope the dinners are fun and the night in the castle are a thrill. Beautiful setting! There is nothing like a well-dressed table. We are making our plans with much excitement and enthusiasm, but may I ask, can you invite more than 8 people to dine? I realize the prize is for 8 people but we have always included the same family/neighbours to our events in the past and it feels like we are snubbing them if they don't receive an invitation too. Your advice would be most appreciated. Chineham, Overton and Oakley to mention a few. I don't know whether you do speak in public but if you were able we would be pleased to have you. Obviously there would be a fee and the date I am proposing may not be suitable for you but would be in March 2019. Sec. Loddon Group and Chineham WI. I was interested to note that you state that there is no cutlery placed above the place setting. I was taught to place the dessert spoon and fork above the place setting. Is this wrong, or is it a personal choice? Thanks for all your interesting posts on your blog. I look forward to receiving your emails. Happy New Year 2018 to you, your family and your wonderful staff! I'm glad to see a picture of Luis who very warmly welcomed us (me and my food allergies...and my husband) to your tea room early July last summer. He was also very nice and generous in answering our questions and the ladies' on the table next to us about Downton Abbey the real and the TV show filming. In all, he just understood that I came a long way just to be there and have a cup of tea and that's all that mattered that rainy day (the first in two weeks we were in England!). Keep writing, it is always a pleasure to read you and look at the beautiful pictures you share with us. Luis is so enthusiastic but has great attention to detail, we have a good team. I have a video of him setting the table to share next! This is my dream as I am sure many others dream this as well. Thank you for everything you are showing us. What a wonderful event. Oh how magical it would be for us to be part of such a special dinner occasion. The thing dreams are made of! Just as well since we live in New Zealand. We met Luis on 14 July - he was charming & made us feel both welcome & special. We’re sure you’ll have the most amazing success & the winners will be the luckiest people ever. More than a wee bit envious. Love your table it is perfect for a party. So nice to see that the Downton dinning room still looks very much has it did in the TV show. What a great piece of information on how to set a proper table. I am in the process of selecting the friends that will be invited to our Downton Abbey dinner party. I look forward to reviewing the upcoming e-mails regarding how to prepare for a formal dinner party. This is so exciting!!! Although I wont be participating this time around, I am finding it so interesting, fun and exciting. Talk about living vicariously--that's me!!! To all the entrants: Good luck, here's looking forward to your journey as you share it with us. I have admired Highclere for many years as my former husband's family lived in Big Horn, Wyoming and knew your husband's mother, Jean Wallop. We used to receive a Christmas card every year with the beautiful picture of Highclere from Jeannie and Porchy. Now I live in New Hampshire at a Life Care facility and for 2 years we hosted the PBS premier showing of Downton Abbey. I lived vicariously by wearing my grandmother's dress and dreamed one day of visiting Highclere. How wonderful of you to open your home to the world and to the millions of people who have enjoyed, and may I say, been addicted to, Downton Abbey. Thank you for your graciousness and your gift. Thank you for entering - it is fun and joins us all together - this is the good part of social media! Dreaming is good, and if it helps support PBS or other organisations then it is only positive I hope! From the moment you posted the contest my imagination began to work overtime; first forwarding your blog to my "Downton" following friends. I received an immediate response from my friends of sheer excitement and inspiration they loved your idea's of creating a celebration in the name of charity! I was thrilled to receive your update this morning regarding the guest list and invitations; it was as if you were reading our minds and your timing was perfect! We have been gathering our resources (our collection of your entertainment book, "At Home at Highclere" along with all of the "Downton Abbey" books that also include recipes and etiquette references for the period. Next on our list is a morning meeting over scones and tea to put our plan into action! We will take photos and e-mail them to you so you can see our progress! Also one more comment, your cooking videos are not only really fun, your recipes work too! It can be tricky if you only slightly know the guests you've invited. So as not to cause any embarrassment to yourself or the guests I almost always check in advance if they like certain foods. The other friends around the table did later agree it was a bit of a strange lunch to prepare, without checking out people's taste. We're having firends round tomorrow and I know in advance they thet all like prawns, turkey and christmas pud. Yes! yes! I know not more turkey, but infact we are doing an other complete Christmas dinner. Just a twist at the end we're finishing it off with Christmas pudding pancakes with warm orange sauce and home made ice cream mmmm. I guess also if there's time, a second dish is also an option, when entertaining people you're not too sure about. If I don't know people I am careful and steer away from shellfish - I think you right here and I do think it is kinder to let people help themselves. How lovely hear from you and to see you are in Williamsburg - I was lucky enough to give some talks there! I so enjoyed my visit it was in February a few years ago, very cold but utterly magical. This is wonderful! I will use it for my next dinner party. 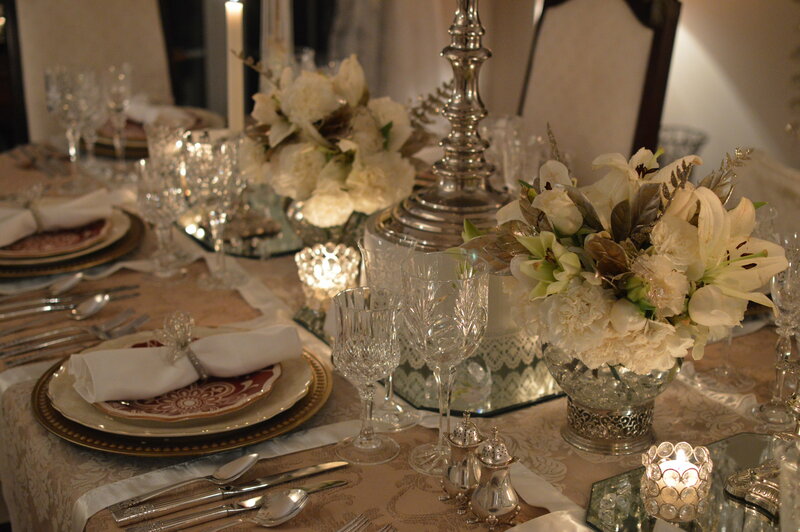 I hosted a dinner party at Christmas and was inspired by the place settings from Downton Abbey, as well as from your lovely book, "At Home at Highclere." I have some cutlery and dining accoutrements that belonged to my grandmother and great-grandmother. I have used them for years, but I feel that, due to the new ideas, my table has taken on a renewed spark of elegance. Thank you again for publishing such a marvelous - and helpful - book. It is nice to receive one isn't it? I will never forget our trip and the Christening of the Viking Sea, we are about to take another Viking Ocean Cruise this month, and have taken several more and have 1 more for this year and 2 more next year. My husband and I love the Viking Cruises and won't try any other. I've heard such great things about Viking Cruises and it occurred to me that it would be just amazing to be able to combine a Viking Cruise, at our expense of course, with Come and Dine. (If we win! )Would that be possible since the round trip travel is covered with the prize? Could it be extended to cover the time a cruise would take? We live in NW Montana and the travel time will be considerable, so an extension would be so wonderful. Also, I registered our interest for the contest but don't see any where to check that you received our information. My wife and I are great fans of Downton Abbey and admire Highclere Castle immensely. As a surprise for my wife I was wondering if it would be possible to attend a dinner at the castle during our next trip to the United kingdom in late October of this year. I'm attending a military function in London and think it a great opportunity to dine at Highclere and stay a night in this amazing setting. I hope this is possible and I look forward to your response. Throughout the video Lady Carnarvon is at her Carlton House desk, in the library, where she loves to go to write. Whether it’s composing letters to family and friends or progressing with her most recent book, Lady Carnarvon is able to truly demonstrate her creative flair when in this beautifully comfortable setting. 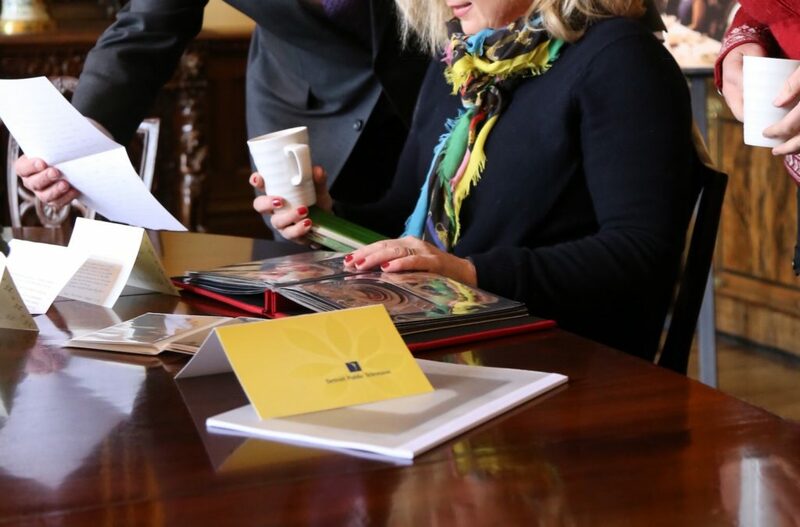 The process behind organising the table layout for Lady Carnarvon’s guests is also shown in this video, along with the place cards, so watch out for the templates when they are uploaded for you to use. There will also be some guidance on how to translate you and your guests’ names into hieroglyphs for a fun twist on tradition. 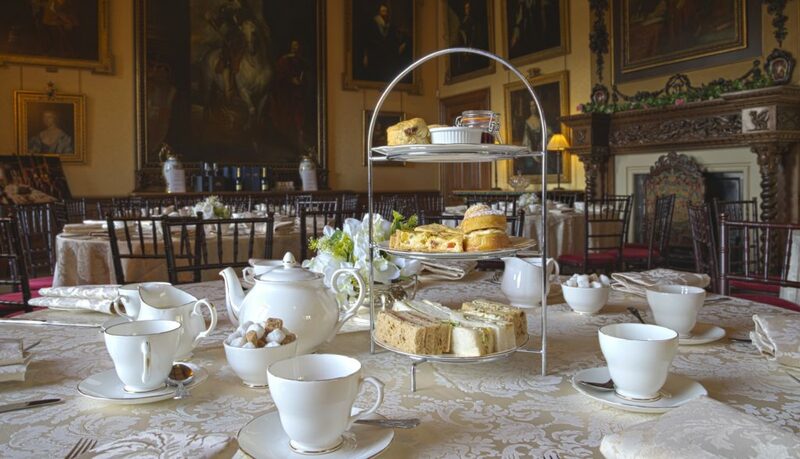 If you would like to know more about the traditions at Highclere or have any dining traditions of your own, please make sure to share them with us. I am going to have a co-hostess for my dinner party. We are meeting this weekend to make plans as to who we will be inviting. We will also be discussing the date for our dinner, the menu and table settings as well as table decorations. I am so looking forward to all of the preparations for our dinner. As soon as we have some pictures of our preparations, we will be sending them along to you. What a great idea that one would have a co-host. That way, you both can create a wonderful collaboration. Thank you so much for sharing your wonderful life with us. It is always so nice to see that there are still places left that take the time to make things fun and entertaining for others. Thank you once again. What wonderful fun to write the cards in hieroglyphs! 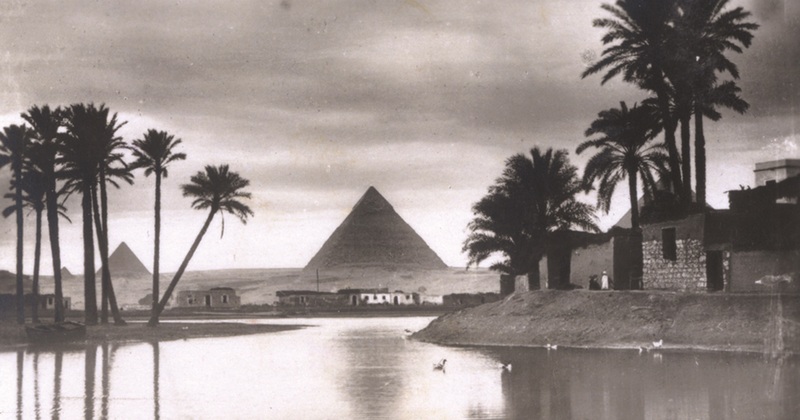 Like Lord Carnarvon's Great Grandfather, my own Grandfather worked in Egypt, although, being an engineer, he was not so fortunate as to discover a Pharaoh's tomb! Keeping one's family history alive certainly provides inspiration for celebration. This will be the starting point of our dinner. Such fun! The hieroglyph cards are such a creative way to bring the past into the present! Wonderful - thank you for your enthusiasm!!! Recently there was an article (possibly in Crisis Magazine) suggesting that we should return to a more genteel life style. Life has become such a 'scrap' that we are all in danger of becoming as unpleasant as the age. Your recent blog is enchanting and will certainly help to re-civilize us, thank you. I love my present little house (warm and cheap to run on a pension) but I miss my large dining room where we entertained all the time. Thank you for your blog..it keeps me in touch with my home country, which I miss so much. Great - may be we have to figure out prizes for the most dinners in a State !!! In Russia we always like to have our guests on Easter ' New Year party,Woman's Day on the 8 th of March,Birthday Party, on Wedding Party .And only on Wedding party we send invitations.Usually we invite our friends or relavatives Our tradition is all the best for our guests.The best tableware is usually for these events.Some of the guests bring gifts even if they don't come for parties,in her turn the hostess of the house gives presents for her guests. Your blog is so informative and useful and make very positive effect and emotions Now I take your idea of planning where each guest takes the seat.And I''ll also write the invataions. I have a request.I 'd like to know what is real original English breakfast is. Thank you. One of the final finishing touches that can be made for your dinner party is an arrangement of flowers to decorate the table. Although Highclere Castle has such a wonderful of team of gardeners working throughout the year, ensuring the grounds look inviting while encouraging biodiversity, during the winter months it can still be a challenge to find the perfect combination of flowers to arrange. Throughout summer however, this is a complete joy as the gardens are alive with colour and humming with bees! Thank you so much for taking the time to record this video. I feel that since finding my way to your blog via the Mary Berry television programme it has been such a pleasure to read and appreciate day to day life and events at Highclere. 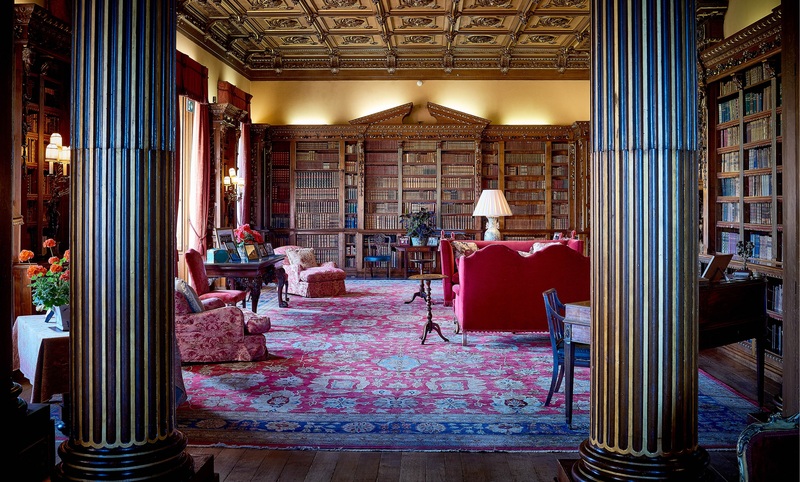 Coupled with reading both your books on the 5th and 6th Countesses of Carnarvon, I am greatly looking forward to visiting Highclere in the summer. Thank you again. 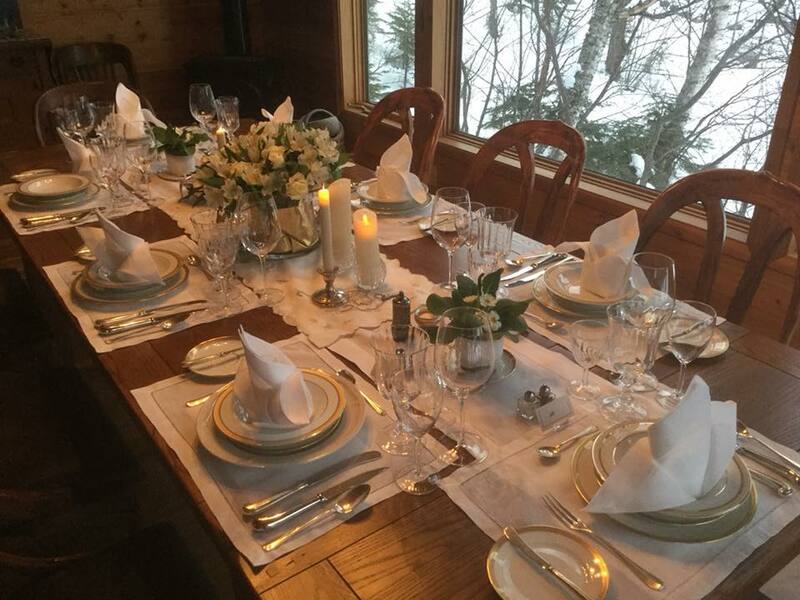 What a beautiful arrangement you have created, Lady Carnarvon, with winter floral for the dinner table! 'Beginning to plan the dinner here in Greece, too, and there are cyclamen (kyklamina) "in season" at the farmers' market, so I might consider a "potted" plant in a ceramic bowl...still dreamin'. I have seen the beautiful grounds of Highclere Castle, and the garden with the sundial, when I visited in April, 2015, ah, the daffodils were in bloom then! Lovely! I have some large pots of cyclamen on tables - a mass of colour! Thank you for this interesting video. I, too, use faded but still lovely hydrangea blossoms, mine in blue. I note that you purchase alstroemerias from the market. I think that these are a wonderful addition to almost any arrangement. They are incredibly long lasting, available in a wide array of colors and cost very little at least in New England! Your blogs are a joy each week! Many thanks. You are quite right alstroemerias are really useful. It is so interesting to watch each of your video.And for me as the non English speaking person it is a great pleasure to listen to your original English speech. You have made very elegant decoration of garden's flowers but without of help of professional designers. I do like to incorporate herbs or fruits but this time of year is the hardest! I really enjoyed your video this morning because I have NEVER thought about putting wire in the flower bowl. What an easy and practical way to do arrangements!! I’ve always used tape but it was so difficult to hide even with the flowers and then when I removed the tape it was so sticky on the edges of the glass. It drove me crazy every time I cleaned the vase. I am definitely going to do this from now on and I promise to give you and your mother the credit LOL. I’m looking so forward to my dinner party and I am trying to incorporate some of your suggestions along with my personal traditions and style. I just think dinner parties are about friendship and laughter - your guests will be invited! Lovely! Thank you for posting. We are all loving you! Thanks so much for the video and sharing your voice as well as your expression and little stories about family! Thank you for sharing about the flowers being from both yours and your husband's gardens!!! !You have become a special friend. Thank-you for this lovely video of your arrangements. A joy to watch. Another really interesting blog & video. It’s so good to have your interesting weekly posts to look forward to each week. We frequently use the heads of white & blue agapanthus (aka African Lilly) for table arrangements as you can cut them short or long & the blooms last for a couple of weeks. You can let them go to seed in the garden & pick them like that. We’ve spray painted seed heads silver, gold & bright colours. An easy to grow versatile plant that flowers from mid-summer to Autumn in the UK. Thank you very much for sharing this video. What type of wiring did you use for this arrangement? I have just begun reading your blog and I feel so at home. I am always excited to receive an update with a new post! It is my hope that one day I will be able to see Highclere and witness the beauty and history for myself. Thank you for letting us glimpse part of your world! Having just read this installment of "Come and Dine" and also having watched the video, I think you mentioned a flower frog, which took me wait back to my childhood. We had lovely gardens and, even as a little girl I do remember enjoying picking flowers and making my own floral arrangements with the help of a flower frog! I have never seen, read about or held one since and I am sure it is still there in our family home. Of course , they are not to be had unless sold on vintage sites, or Ebay which I am seriously thinking of purchasing one or two. I also watched some of your "Cooking with Lady Carvarvon" videos which I did not know existed. Such easy to prepare dishes and they looked delicious-- the roasted fig salad, yummy!! Perhaps one of these years, you could do another event where the public have a chance to work with you--a cooking event!! That I am sure would go down very well. Best wishes from sunny California! Today is the day when you can start hosting your dinner parties, so we are looking forward to receiving your entries in the coming weeks. Remember to check the main Come and Dine page for everything you need to submit! We are very much looking forward to receiving your entries and seeing a fantastic mix of dinner parties from around the world. 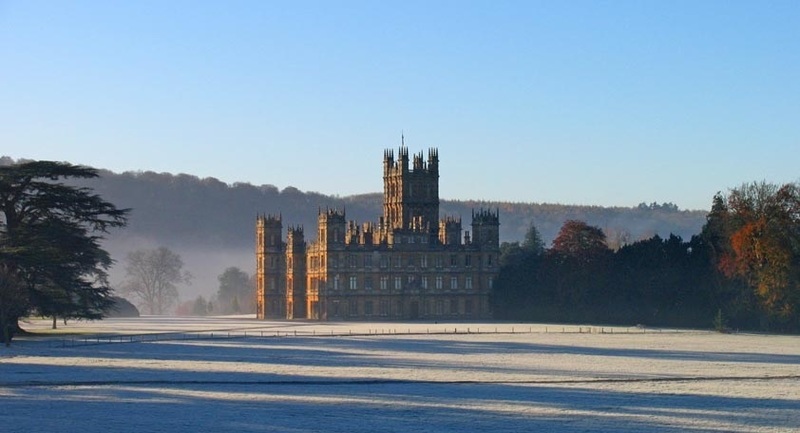 It is a wonderful opportunity to do something so fun and enjoyable during February for the chance to Come and Dine at one of the most famous homes in the world, Highclere Castle, The Real Downton Abbey! Although we are too far away to attend any dinner party at your lovely home, I would suggest that you check if Lord Carnarvon has among his world collection some Chilean wines, one of the best in the world. Check out the seriouseats article on Chilean wines. We do enjoy a quest for exploring wines from the Americas as well as Europe. I thoroughly enjoyed the wine selection video and such outstanding wines. I particularly would be interested in the diner’s response to the 1933 Madeira and the chocolate pots. I am usually more of a savoury diner than of sweets, but the mere thought of that combination of food and wine for dessert excites the taste buds. Also, good luck and best wishes to all who will be hosting dinner parties during February. May the competition bring much merriment to all involved and raise donations for PBS and other charities. Thank you!The Madeira is rather special, fun to bring out as well as delicious. Luis does pair wines and of course pudding wines really well. I was disappointed that California wines were not chosen. We have any fine vintages that would have gone great with your dinner. You have some excellent wines and in fact part of this prize is to stay the first night at the Vineyard Hotel near us and enjoy a wine tasting. Sir Peter Michael and his family own it and have some outstanding Californian vineyards and wines - http://www.petermichaelwinery.com/ In fact we have some but I guard the bottles!!! I live in Napa Valley and we have wine coming out of our ears - the trend is younger wines currently - so it is nice to see you picked some oldies but goodies for dessert and aperitif. Just love a port to finish!!! I have a GOLDEN RULE about wine selection! RED wine for all types of red meat! WHITE wines for fish and poultry of any kind! And if it is a cool night, warm the wine before drinking it, and you will get the BEST night sleep you have had in years! What an interesting blog. It was fun to see the wine cellar and see Lord Carnarvon choosing wines for dinner. I enjoy wine from time to time, limited due to health reasons. But, there are so many wonderful choices. I generally am a wine snob only choosing French, Italian or German wines, however since leaving California to live in Texas, I have found endless choices in wonderful wines. You can find a map of all the Texas wineries in the hope that some of them will appeal to you. There are many places in the U.S. that offer notable wines but are, perhaps, not as widely publicized. As you can see, nearly our entire state is covered with wineries. I hope you enjoy our wine tour. Many thanks for your keeping us up to date with Highclere Castle goings on. I'm in Washington State, along the Columbia Gorge, which is quickly turning into the new "Napa" Valley! We have even made wine ourselves! My father was a wine maker! There is nothing more adventurous than a well stocked wine cellar! Love the round flower vases that show all the stems. Also, this week, I saw a great program on our travel channel showing the opening of Tutankammon's tomb with mention and photos of Lord Carnarvan. I thought of you immediately. I hosted the Come and Dine dinner on Sunday, Feb.4, and am now preparing the photos and commentary with all the necessary info to send in soon. I am thinking of a short summary to send to your email, but a more detailed presentation, with the Greek text and more photos in a packet via snail mail. It was great fun and we had your recipe of Poulet Maryland from "At Home At Highclere", also the rack of lamb for the "roast", and the "Lords and Ladies" enjoyed it very much. 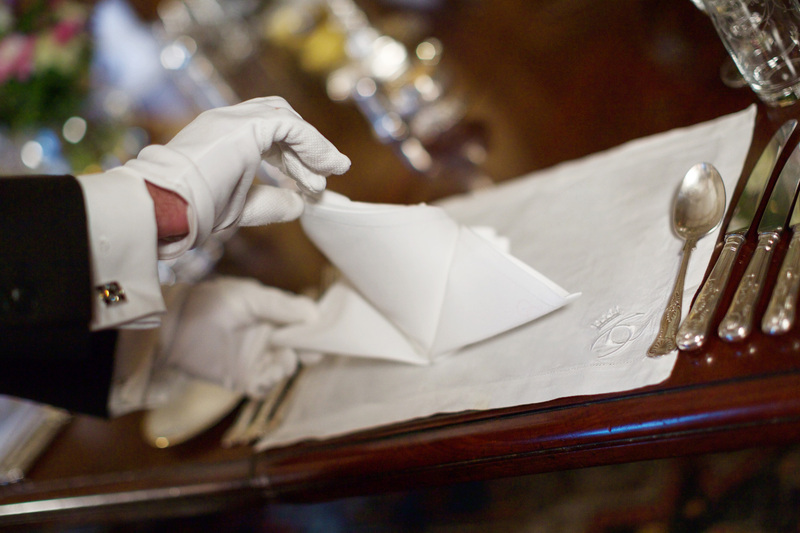 I had noticed the napkin fold that is used at Highclere and found a similar way with the "fleur de lile" style. The Greek guests were in awe as they held the "petals" and then, snap...the napkin opened up immediately to the triangle for their laps! Elegant! You are amazing - I so look forward to it! Little did I know what a SURPRISE I would be waking up to this morning when I opened your latest, "Come and Dine" update! The first thing I saw was my name along with one of my co-host's names on your blog! Then I clicked on "READ MORE" and immediately saw the photo's you posted of the stages of cooking your soup recipe; I screamed out loud with joy, THANK YOU! Although it was not even 7 a.m. yet I called my friend Jill and she answered the phone as I forwarded your blog to her and then she started screaming with delight as well! Minutes later we started receiving texts of excitement from the other ladies; Susan replied, "THATS AMAZING" and Tina said, "SHE WAS OVER THE MOON!" 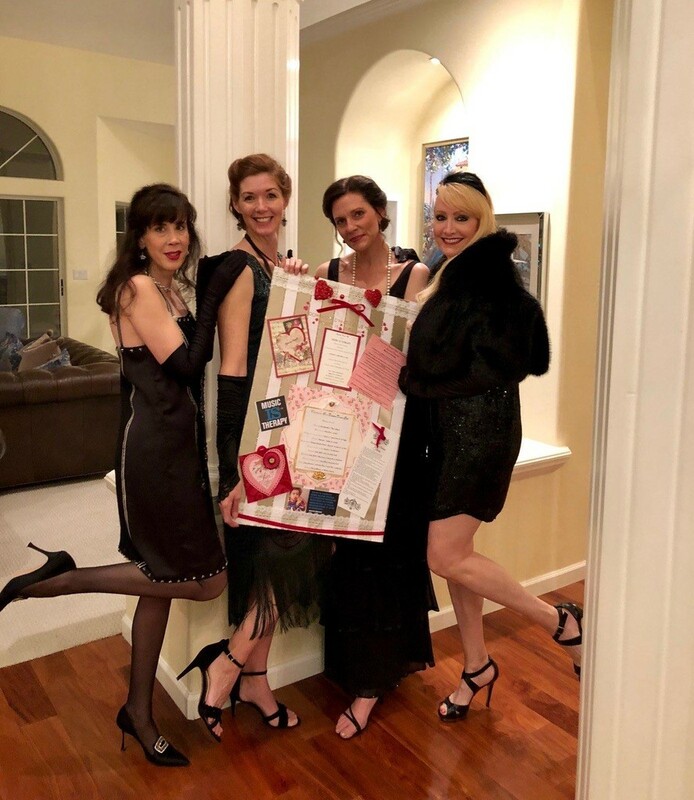 We just wanted to share with you how much this little idea of getting together with four friends to organize a Valentines dinner party in the name of our love for all things "Downton" has grown into something much more special. We have tapped into our friends foundation and are using our resources and creativity to spread out and touch many lives beyond our own with new friends, students of music and children who need our attention in hospitals. Good - it is just swapping notes between us all! Reading about this competition is so exciting: I can't wait to see photos and videos. What's even more exciting is that I ordered your "At Home at Highclere" coffee table book and the postman just delivered it. It is not even out of the plastic wrapper yet!!! I am going to flip through it as soon as I send this comment off. I am writing from our home here in Southern Georgia, USA . 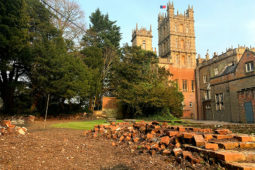 I have just watched a beautifully present tele show of tbe "Downtown Abbey" with the cordell backdrop so fitting in the beating heart of Highclere, presented by the Lord and Yourself. Realizing the Lord and yourself are Stewards to the place you both call Highclere home. As a side note, I once lived, not so long ago, in Sunningdale, Berkshire,UK. Now retired back in the USA. Both my Fiancee' and I are joining friends in the UK to travel about for history and my family heritage. We will be looking at Highclere's website for opportunities to visit during the summer 2018 if possible. The Rothschild Family are friends of mine here in the US, as they are still in the Fabric Industry in Columbus, Georgia, my hometown. As time passes in February we recieve more and more of your wonderful entries for ‘Come and Dine’ from around the world. Lady Carnarvon’s book ‘At Home at Highclere’ has provided the inspiration for so many of the dishes being served at your dinner parties which is truly lovely. Here are a two videos of Lady Carnarvon preparing ‘potted shrimp’, a delicious starter to enjoy with dinner (or to accompany a favourite episode of “Downton Abbey”!) and ‘chocolate pots’, the perfect way to end your meal. For those who are yet to host their party this will provide the step by step instructions on how to prepare each course, but of course is also something to enjoy even if you have already submitted your ‘Come and Dine’ entry. These chocolate pots are such a wonderful and decadent desert, which have been enjoyed by the Carnarvon family for many years. Lord Carnarvon made particular reference to them when choosing the wine as an accompaniment at a recent dinner party at the Castle, which you can see here. If we host our dinner at the eleventh hour, (Feb 28th) what is the deadline for submission? The deadline is 28 February at 23:59PT, so depending on where you are in the world you may have an extra few hours to submit your photos, which we very much look forward to receiving. If your email is all drafted and ready to go hopefully it will only take a couple of minutes to attach your photos and send off. The chocolate pots looks delicious and seems so easy to prepare. I will try this. 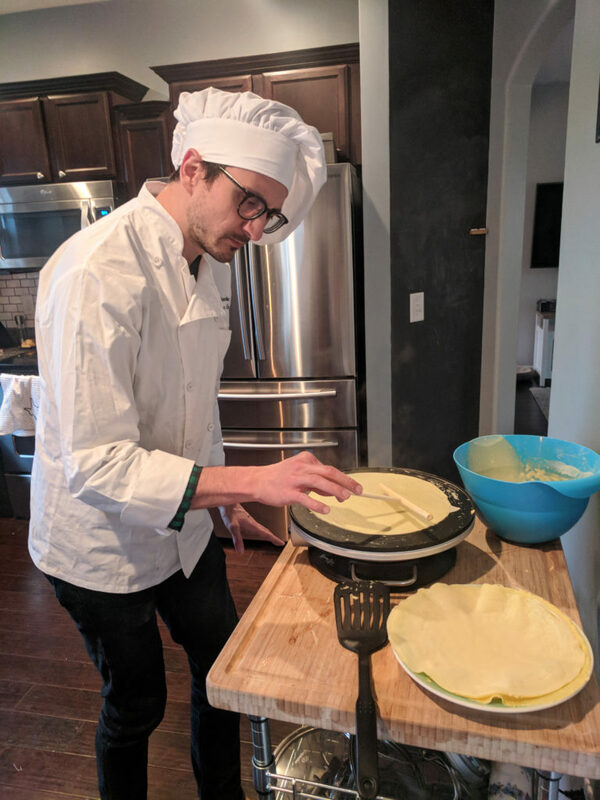 Your cooking videos were delightful, you seem a natural at this, and I hope that you might consider sharing more of these with us? What a lovely accompaniment to your wonderful Entertaining at Home cookbook! This is wonderful! It’s like being at Highclere and having you so graciously guide us through your home. I like potted shrimps beause first of all I like prawns and shrimps and I looked for the recipe how to cook. And that's why I got your video just in time.It is not difficult to make it.It's rather simple and it does not take much time but tasty.I think these three things rather important when we cook. Your chocolate pots look decadent and absolutely delicious! I look forward to enjoying this dessert with my dinner guests tomorrow night. I know they will love it! Chocolate and orange is such a fantastic flavor combination. Thank you for sharing the Chocolate Pots video. I have made them twice as trial runs for our big night this Sunday: once with Lady Almina's vanilla finish and once with your orange version. As we are fortunate enough to have oranges ready to pick in the garden, we cannot help but prefer your orange version. "period-correct" transportation for the guests, setting the table, practicing flower arrangements, studying your latest book and trying your absolutely wonderful recipes. We have made an effort to showcase our California locale into the event by incorporating the beautiful peacocks that roam our grounds into our theme and adding backyard produce like avocado and persimmons into the menu. Thank you for your fabulous inspiration and for your recognition of the national treasure that we have in PBS. Your chocolate pots look absolutely fantastic, and I am such a choco-lover. We had, of course, creamy chocolate cake for my birthday "Lords and Ladies" dinner that I hosted on Sunday, Feb.4th (email and photos sent!) But I am going to gather the same friends after Easter holidays and surely make your chocolate pots! We did have steamed shrimps for our fish-seafood course, along with the octopus and calamari...so Greek! But for a luncheon treat I shall try your potted shrimp, sounds tangy and tasty! Thank you, Lady C., the "Come and Dine" event idea is so much fun. Thank you and have Greek weather and heritage!!! I like potted shrimps beause first of all I like prawns and shrimps and I looked for the receipe how to cook. And that's why I got your video just in time.It is not difficult to make it.It's rather simple and it does not take much time but tasty.I think these three things the most important when we cook. Wonderful videos and the funny thing is that while I was watching them, the theme song from Downton Abbey came on my radio station! What a coincidence! Must try your chocolate pot recipe. Thank you for sharing! I am so pleased that I received an email with a link to your videos. I've watched several and I am eager to try the chocolate pots. A couple of years ago, I enjoyed a wonderful tour and high tea at Highclere Castle and this took me back.................and made me smile. Kudos to you on your fund raising efforts for PBS. So many Americans love the programing and we appreciate what PBS offers. Will the potted shrimp and chocolate pot recipes be posted with your other yummy recipes eventually? I do better with detailed instructions I'm afraid! Thanks! They were/are in "At Home" but we have separately created some recipe cards we can print and post here which I think are nearly there! Thank you so much! Although I am not participating in the contest, I very much look forward to trying both of those recipes :) I continue to follow the progress of the event with great interest and delight! So sad, I won't be able to host a dinner in time this year and hope you will make this a tradition, looking forward to next year. I just moved and I thought my condo/flat would be more ready to have some guests than it is right due to renovations. But I'm keeping the ideas... and those chocolate pots look amazing, I will try that for sure! Simple and delicious, that's my kind of recipe! You do not have to do anything - if you wish to ask friends for dinner wonderful! Thank you for sharing recipes with your lovely 'chocolate pots' video. I am having company tonight & will be delighted to make these delicious chocolate desserts! Chocolate will certainly warm our hearts, and take the bite out of the cold weather! Greetings from Texas! I hosted my first ever real dinner party last night for a small group of friends to celebrate a very special and seemingly miraculous birthday (details in my email Come and Dine entry). I'm so thankful you are hosting this contest because it was the driving force to plan and prepare something fun and exciting. Thank you for continuing to open your home and life to all of us. You are a great inspiration. I hope we made you proud last night! I think you are all pretty amazing! We are approaching the final 16 hours of Come and Dine, giving only a short time to submit your entries (until 2359PT). We have been delighted to receive so many wonderful photos, videos, and descriptions of your parties, which we will have the pleasure of sharing with you during March. It has been so enjoyable to get a sneak peak at everything you have all been doing over the past month, with some truly inspiring entries! Our senior judges are preparing to make some big decisions over the coming weeks as they will sit down to go through your wonderful submissions. 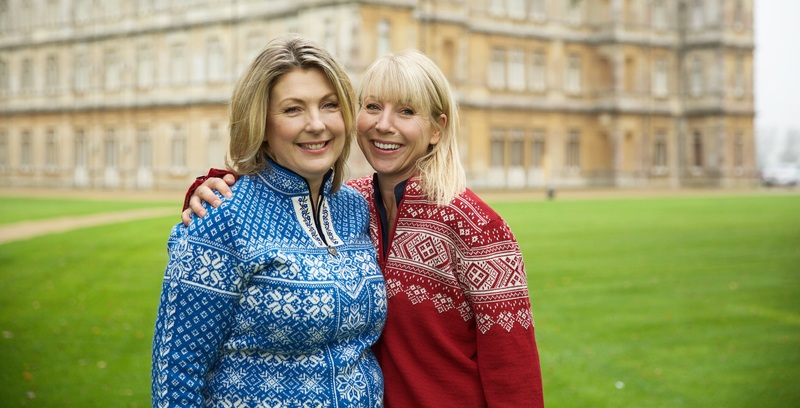 Lady Carnarvon and her good friend Karine Hagen, Senior Vice-President of Viking Cruises, will be joined by Andrew McKenzie, the Managing Director of the Vineyard Group, to select the winner. We look forward to sharing all the wonderful events you have hosted and of course announcing the lucky winner of the Grand Prize. It has been such a lovely experience as well as a fantastic opportunity to raise money for charities worldwide. I can't wait to see the final winner !!! Thank you Lady Carnarvon for your speedy reply to my comment on your blog !!! I think visitors would love to where the servants used to sleep and get "the whole picture" of life at the castle !!! Once again thank you for your lovely posts and I hope to see many more !!! Lots of stairs to climb so we could all do the 10,000 steps a day!!! Your idea was full of fun, friends and inspiration for not only one month of memories but we intend to continue through the year with the same verve!!! Thank you so much!! Can’t wait to enjoy others entries as well!! It has been amazing for us as well! It was a pleasure to be able to participate! 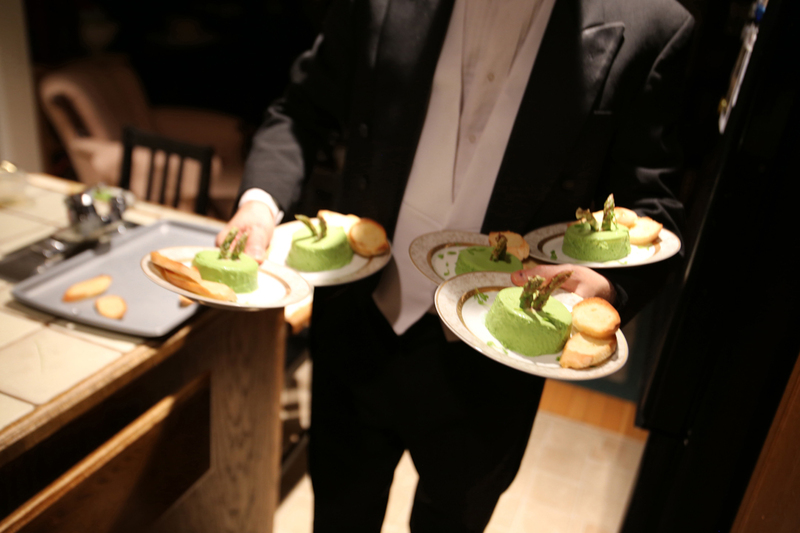 I had a lovely dinner party, raised funds for our local PBS station - KBPS - and was inspired by the recipes in "At Home in Highclere." Thank you for this opportunity. Thank you so much for bringing about the wonderful Come and Dine idea, to benefit PBS. Our group had such a great time planning and preparing for our dinner on February 24th. We all had such a fantastic evening. Even the weather cooperated and it was a beautiful evening. It was really a lot of fun sharing a wonderful elegant dinner with good friends. Everyone joined in by wearing clothing that was typical of the Downton Abbey era, from the 1890's to the 1920's. I had did have a bit of a problem with my computer while submitting my entry, but I do hope that it finally arrived and you were able to see all of our wonderful photo's. We're all hoping to win, but if we don't, it was still a great evening and a chance to experience a little of what it was like during the "Guilded Age". Best wishes to all of the entrants. How amazing and you clearly has reliable weather! Good luck to everyone who entered! Without a doubt, everyone who participated is a winner just in the sheer fun and enjoyment of it all, and I can't wait to see some of the entries in the coming weeks. All the best! Jody. This is so exciting! I can't wait to read all about it. Good luck to all the entrants!!! Dear Lady Carnarvon ......I think climbing those is a marvelous idea !!! Visitors will get hungry and thirsty and make haste for refreshments !! Think about those poor souls that would have to walk these stairs after working all day !!! But I think they were happy to have a roof over their head, food to eat and proud to tell other people.....we're part of Highclere !!! I am sure everyone who participated was a “winner”. Amongst the perfectly laid tables, the delicious food, the vintage wine and the finery, there are the joys of good conversation and conviviality with one’s dining companions, one’s friends. One of life’s real joys that can so often can be taken for granted. And what varied topics can be discussed - even more so with a little nectar from the vine. 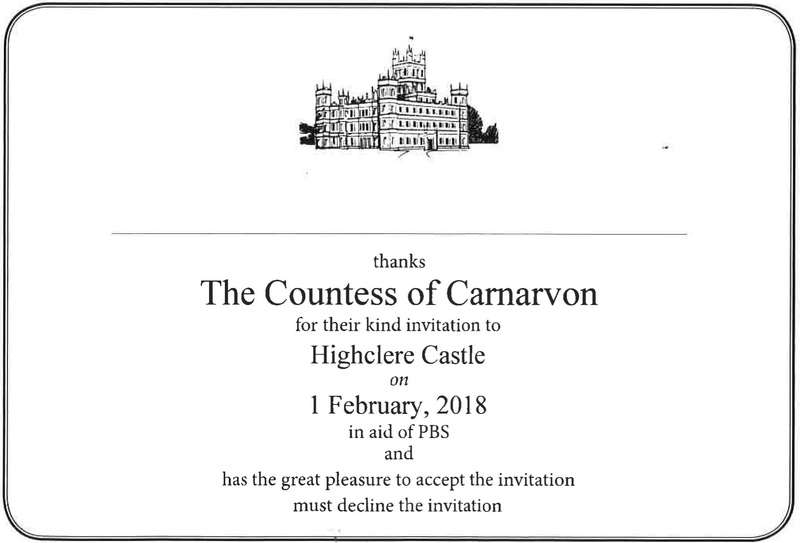 Best wishes to all and congratulations, Lady Carnarvon, on this wonderful initiative. Just like a plot twist from "Downton Abbey", my lunch event came with it's own drama! We got unseasonably warm weather this past week & I turned on my air conditioning for the first time this year. It quickly became clear that my ac unit was not working properly. Since my lunch was only two days away, I immediately scheduled a service call. The repairman felt more coolant would do the trick. Sadly, that was not the case. During the visit, my fan motor ceased to work altogether! A picture of six women sweltering in their summer dresses and hats, flashed thru my mind. Panic, panic, panic! I am not sure if it was the look on my face, or the stress in my voice as I explained the situation but after a few phone calls--it was deemed an emergency and my job was moved to the top of the list. So....one day before my luncheon, I had workers, equipment and mess everywhere! I was cooking in a kitchen with no air---just a fan blowing in the general direction of my oven. But, by 6 pm, the new ac unit was installed and it was becoming blissfully cool again. And, my lunch went on as scheduled. Thank you, Lady Carnarvon, for inspiring me with your marvelous ideas and delicious recipes. It was such a pleasure! Best of luck and good wishes to all participants! From Canada - Three fold thanks: to our wonderful guests who jumped right into the spirit of things, to Highclere for literally "cooking up" this great fund-raising campaign and to PBS, may the donations boost your programming which we all enjoy so much. It was also a great pleasure to welcome you into our homes as you have welcomed so many of us. It will be so much fun to see what others have done, around the world! Thank you, Lady Carnarvon, for such an inspiring event. We plan to continue in the future with round-about visits to other friends' homes as the other "Ladies" wish to try out in their kitchens some of the recipes in your book, "At home at Highclere". 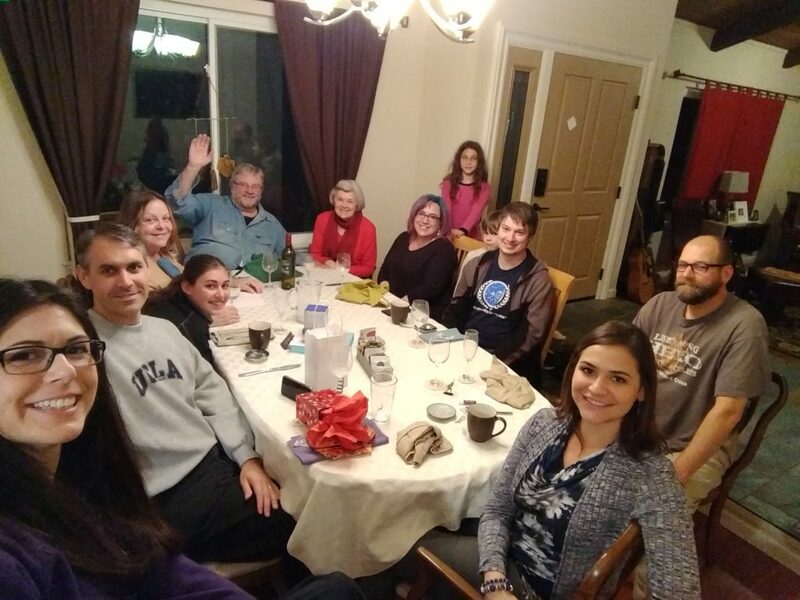 We are all winners, really, for "there is nothing more delightful" than to gather around a table, with good food, good wine, and good friends! This is off topic to your Come and Dine, but I just wanted to tell you that I had occasion a couple of days ago to speak with one of your lovely office staff. I had a question regarding my tickets for our upcoming visit to Highclere and the lady I spoke to was very friendly and helpful. This visit is a dream come true for me. See you May 28th! Wonderful ! They are great! In preparing for our party here at "Peacock Glen" in Arcadia, California, we thoroughly enjoyed trying out and practicing so many of your delicious recipes. If you would entertain the possibility, we should advocate for a lifestyle/cooking show for you here in America on PBS. It would be so well-received! The lovely Karine from Viking Cruises could be your first guest and you could include a segment shot at the absolutely gorgeous Vineyard Hotel. I would love to do something like that! We were unable to host a dinner but we have certainly enjoyed reading your updates in Come and Dine and about everyone’s progress and experiences! We have your lovely cookbook and we anticipate the announcement and their dinner menu. Will the winning photos or video be shared with us? Most importantly we anticipate that we may see a wee bit of the Come and Dine experience in a short video at Highclere with you and your husband and the winning group! The judging is taking place this month with our good friends from Viking Cruises and The Vineyard and we will share all of the entries (including the winners) on here over the coming weeks. 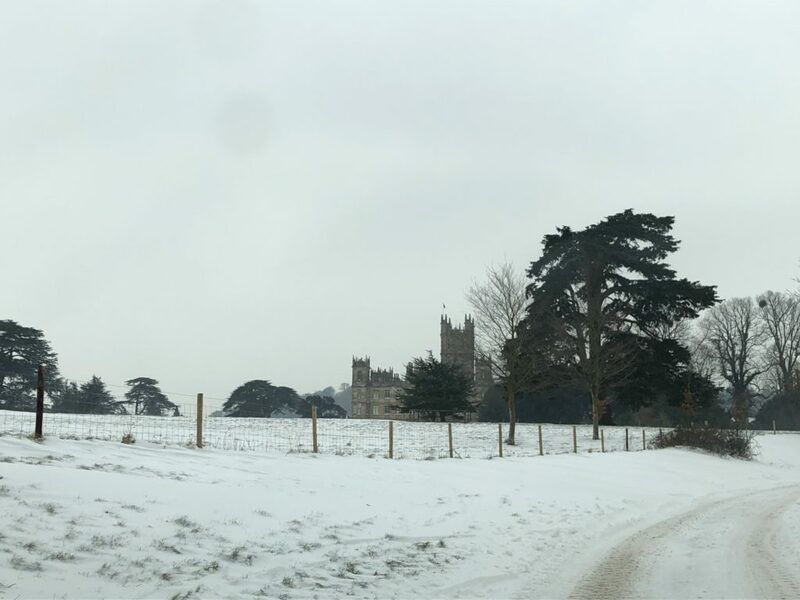 Despite the snow hitting Highclere Castle, our judges have been able to spend the morning going through the first round of entries. 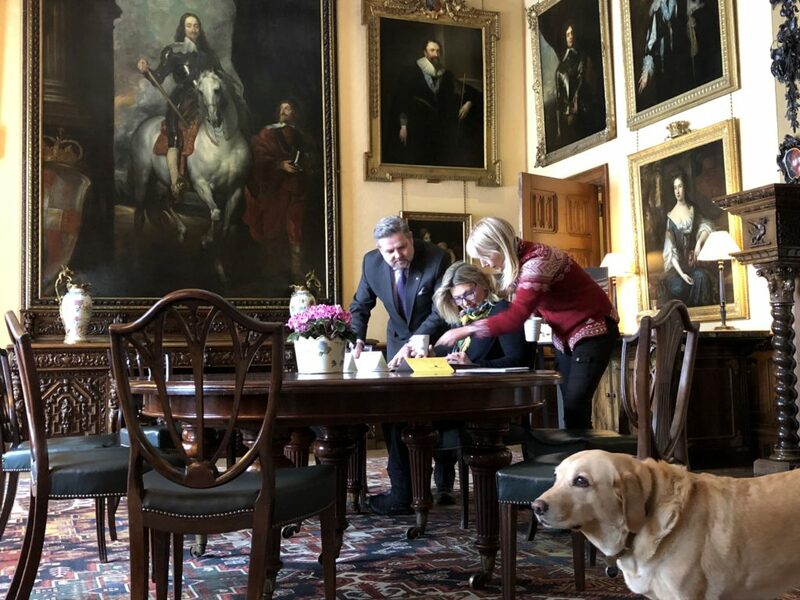 Lady Carnarvon has been joined by Karine Hagen of Viking Cruises and Andrew McKenzie from The Vineyard to start the judging in the dining room, with the assistance of Finse, overlooked by Charles I. We have been lucky to receive so many entries, allowing us to see everything you have been doing from the USA and Canada to Australia, Norway, and The Netherlands. Some of the entries have brought a tear to the eyes of our judges as you have shown such dedication to not only hosting a wonderful dinner party but donating to PBS and charities all over the world. 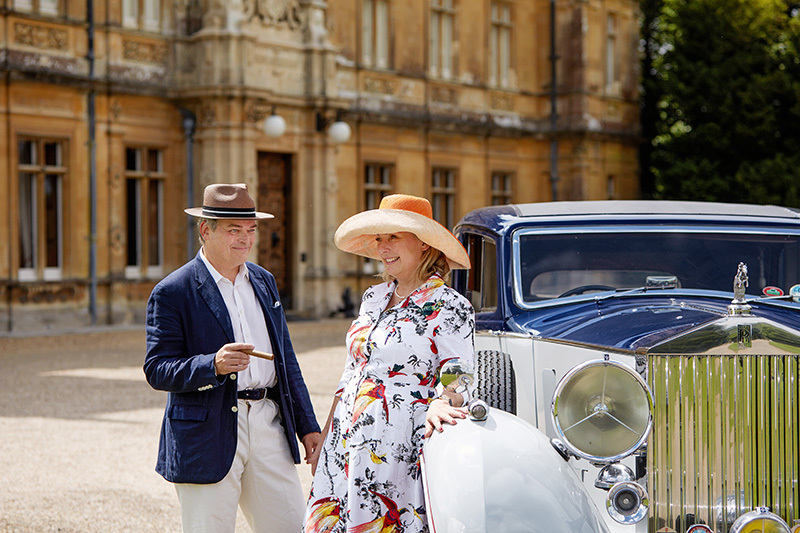 There have been replicas of the Titanic, amazing photos of the recipes in At Home at Highclere, vintage cars, masquerade balls, Downton Abbey themed parties, and an amazing mix of guests (with the dogs being particularly appreciated by Lady Carnarvon and Karine). All of these amazing things have provided a platform to raise awareness of PBS as well as the opportunity for people to do a little bit extra for charity. It was a great pleasure to welcome you into our homes as you have welcomed so many of us. Thank you for "cooking" up such a great fundraising campaign for wonderful PBS and other charities. Great fun was had by all! Looking forward to seeing your favourites. It would be difficult to concentrate with that overwhelmingly powerful portrait of Charles I on his magnificent horse looking over my shoulder! I would be gazing at your gallery in awe! Although unable to participate, we have followed with great interest your competition and very eager to see the creativity of the participants and cheer for the winner! Lovely photo of you all hard at work with Finse standing guard! I can only imagine how gratifying (and fun!) it must be to see your inspiration and your household recipe's spring to life around the world. To know that you are spurring others on to both do their bit for PBS and create a lasting memory with family and friends must be rewarding indeed. There has been a lasting glow and a sense of generosity and goodwill amongst our group ever since our dinner. This undoubtedly has a ripple effect to those around us. Very well done on the part of you, Ms. Hagen and Mr. McKenzie. I believe that together we all are making the world a little bit better and kinder, one dinner party at a time. Well, you three (four, counting Finse of course) look as though you're having a great time going over our entries. What a perfect setting, too. We had such a great time with our party and can hardly wait to see a little of the others. I also want to thank Jonah in the office there for his thoughtful care when presented with my problems transmitting photos with my hardly adequate server. He was able to make suggestions that eventually worked. Please pass on my thanks. All for now, from heavily snowy NW Montana! I love how the 2nd picture also included your dog - reminded me of Downton Abbey scenes with Isis. Always love seeing pictures of your events, thank you for sharing! I am sure the judging will continue to be a moving experience. It was such a pleasure to participate! I was not able to participate but I look so forward to seeing all the pictures of those who did! Looks like Finse is on guard to make sure the judging goes well and Charles I is definitely keeping an eye on all the goings on! Can't wait to see all the wonderful dining moments from around the world, you surely are an inspiration for all of us. Sending some warm Greek sunshine your way, stay cozy by the fireplace and may the Spring sun come soon! Be still my heart --- to see all of you in the dining room (including the dog))looking through entries is just like me using the dining room table to address Christmas cards (in November of course). I love seeing pictures of the Lord and Lady of the manor doing ordinary things -- I guess I have fairy tale thoughts that place you in tiaras and royal robes all the time! I am sad to say I was not able to send an entry to the contest. We support PBS as it is, but I really wanted to enter the contest. We are re fitting our old house and there was no place to host such a gathering. I'm so disappointed! But I look forward to following this exciting process, even if I could not be a part of it. Thank-you so very much for doing such a wonderful thing for PBS! I loved seeing the photos of you allin the dining room sorting the entres! You are brilliant to do this! Loving hearing all that is going on at Highclere and hope that you are warm and safe during the snow storms that have hit. That is a beautiful photo of the castle in the snow! I can't wait to see your favourites!!! So excited! The tables set in Downton Abbey were fabulous just to look at let alone sit! 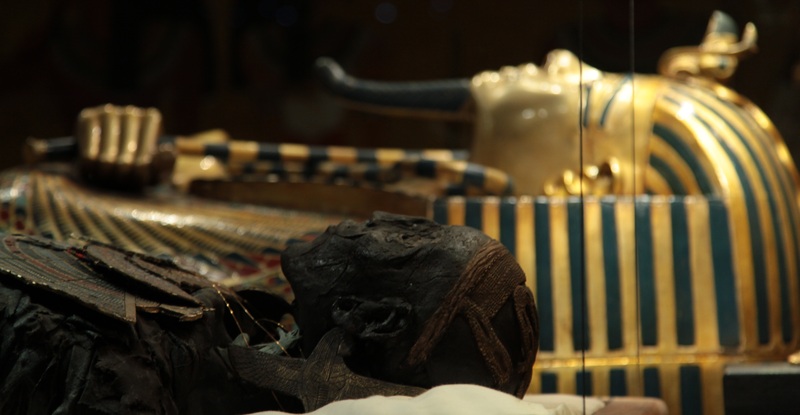 And on another note, perhaps off-topic, but I thought I would let you know that the King Tut exhibition is out here at our California Science Museum. Can't help but think of Mr. Carnarvon back in the day! Come and Dine has been a wonderful success with entries from all over the world. While reviewing your photos, videos, descriptions, and inspiration for your parties we thought it would be a lovely idea to let you all see what we have had the pleasure of enjoying. It is so rewarding to the amount of joy that Come and Dine has brought to people. It is such a joy to see not only the fun people have had in hosting, but the dedication shown to help raise money . 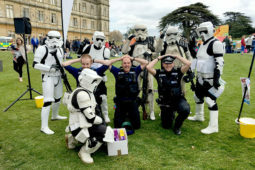 You can see from all the photos below there have been Downton Abbey themed parties, recipes from At Home at Highclere, dressing up, donations to charity, and amazing use of the materials we have provided on the Community page. Thank you for posting these wonderful images. I have been so excited to see photos of our fellow "comrades in arms" parties. This has been such a fun and creative communal event. The smiles on the participants faces are priceless. Thank you again for the inspiration. It will be hard to choose the winner.they all look lovely. How exciting to see our music room photo as your 3rd picture!!!!!! And it is indeed a treat to see all the other revelers in fun and finery. This world-wide party, sharing community and providing funds to PBS and other charities has been a brilliant idea! We look forward to the continuing saga . . .
What a Beautiful Ladies, Beautiful table! I wish to be there. I know the Castle, I went there but I did not have a dinner it would be so interesting, so...great! So so fun! I LOVE seeing all the photos and it brings it right back to our fun night too!!! We have all been rewatching our Granthams and enjoying it all over again!! Thrilling to see our photo in the line up!!! Thank you so much Lady Carnarvon!!!! So exciting to see our photo up! Love reliving that night in time. Oh what fun and friends from around the world! Thank for sharing the photos, what lovely Lords and Ladies...and servants, too! 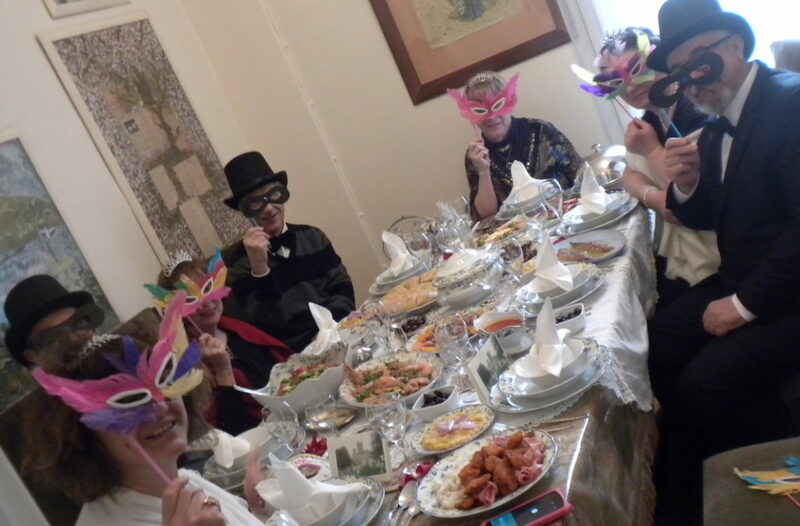 Our dinner was on Mardi Gras Sunday in Greece, so there we are with masks in the 4th photo. Thank you so much for posting. 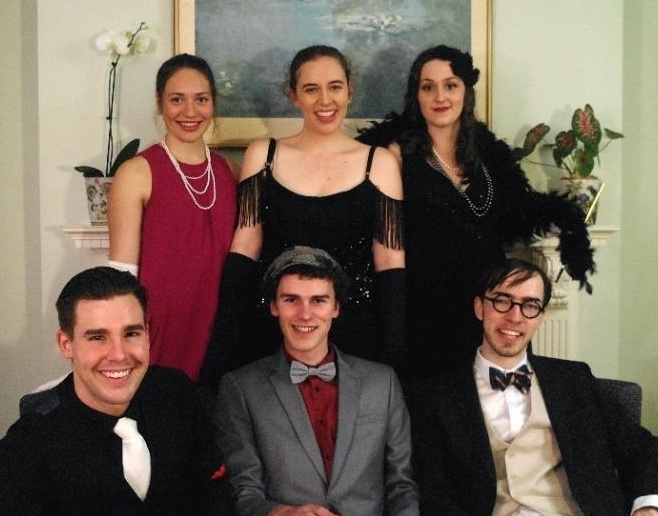 How wonderful to see all these photos and think of the special dinner parties that were enjoyed by these friends! It was a real treat to see one of mine included. Thanks for encouraging us to host a gathering and plan a special evening for our friends! The sense of fun and camaraderie! You were the amazing people!!! Such fun to see! I have my favorites, but I’m sure that you’ll do the difficult judging, admirably. They are all great! Thank you and please tell me what you think of it! I am soooooooo jealous! I know a good time was had by all! Great fun to see all the work that people have put in to this project !! Wouldn't be fun to have duplex dining rooms, one dining room a la Downton Abbey and one in today's world ?? I have been waiting for this day and I am not disappointed. I am very impressed, especially with the table settings, food presentation, even the serving of the food, all looked perfect. Much thought and creativity went into preparing even the invitations! I am sure tons of happy memories were made planning and preparing this event and the event itself. Well done all!!! For ‘‘twas Downton Abbey done with a wink! My apartment is less than 400 square feet so I didn’t participate, but it is great to see that so many of you had such a wonderful time. Next year I’ll have to see how creative I might get on a small but grand scale. Thank you for sharing some of the entries, Lady Carnarvon! What fun they are to see! These are all so amazing! I can't wait to see more - especially my own. My group had so much fun doing this - it was a night none of us will ever forget! Wonderful photos! I was particularly impressed by the group who did the Downton Abbey line-up outside the house. Such a clever idea!! Unfortunately I was not able to participate I love throwing dinner parties! What a joy it was to see some of the events held by the "Come and Dine" contestants! I can tell that EVERYONE put such effort into their events -- finding costumes, researching and cooking delicious period foods, setting lovely tables, arranging gorgeous fresh flowers… Each group seemed to have such fun! I especially love the six ladies and gentlemen in photo #10, who are trying to achieve the serious posing of an aristocratic family in the post-Edwardian era. But laughter breaks through! Thank you, Lady Carnarvon, for opening your home and allowing us to continue enjoying Downton Abbey after the series end! Nice dinner, wish I was there to be a part of it. Saw Downton Abbey reruns recently and miss that show. Will they try another run of it and set it to the latter 1920's to 1930's? We are all hoping they will make a film ! And now it is March 31st.........is the announcement of the winners coming today on this site? We are having a great deal of trouble waiting to hear the results of this really fun and creative contest. I am looking forward to sharing... photos and videos to come! And now it is May 7, and a wonderful surprise package has arrived in Greece from the UK! Thank you so much for the lovely gifts and the kind note of thanks for our participation in "Come and Dine". Such a beautiful frame with the photograph of you and the Count, and a stunning watercolor print by Sue Finnes! But most fun...is the Highclere Castle apron, to be cherished and used often! (wish i could send a photo , ha!) Thank you, Lady Carnarvon, soooo much for all that you do! Thank you and I feel lucky that we salute each other across a blog! Trying to find an overall winner for Come and Dine has proved to be a very difficult process. The variety of entries we have seen while reading through all the submissions means we want so many of you to be winners. Such creativity, dedication, and loyalty to a charity or cause has been shown by so many amazing people around the world. Thank you all for participating and being part of this very special competition. 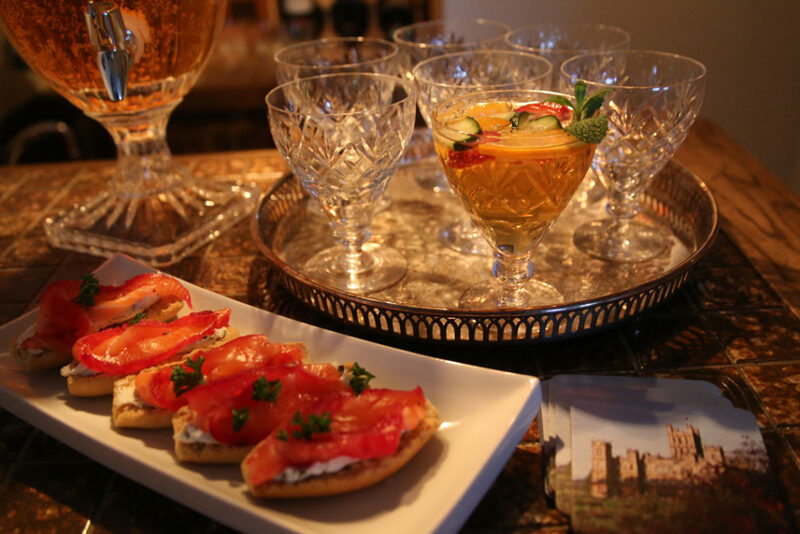 The aim of Come and Dine was to engage with everyone who loves Highclere, PBS, Egypt, Downton, food and dining. The response to all these themes has been wonderful. Despite this we have had the difficult decision of having to choose one Grand Prize winner. This person went above and beyond everything we were expecting from people entering Come and Dine and we will be thrilled to announce fully to the public who this is next Thursday (5th April). We’re anticipating this great announcement Thursday, and we are so excited to see the grand prize winner. It’s been a delight to follow along and see all the different contestants and their entries. Doing good is rarely easy. I am excitedly waiting to congratulate the winner. I just want to stop in and wish ALL of you and the Earl a very Happy Easter Season. I hope that you find all of the baskets and may they be filled with your finest eggs and candies from around the world. Please be sure to have them placed high enough so that all of your dogs will not be able to reach them. There really are no losers in such a contest; the overall theme of sharing and giving was entered into willingly and joyously by so many. Quite a tribute to you all! I hope to visit someday! It must seem like heaven! Happy Easter! A blonde woman driving down the highway sees a man crying on the side of the road and pulls over. She walks over to the limp, dead Easter Bunny,bends down, and sprays the contents onto him. "Hair Spray - Restores life to dead hair, and adds permanent wave." It is so exciting to hear that the winner will be announced in a matter of days. I am thrilled for the winner in advance; however, based on the number and quality of entries it seems a runner up or two would be quite appropriate. Oh well, I feel certain that there will be other opportunities to participate in such a contest in the future. I am a huge social history enthusiasts and as such have been reading and collecting any book I can find on the subject and of course the history of your husband's forbears is all part of it. I am interested in visiting Highclere in the future and I am just curious as to whether one will be able to see all of the interesting places and exhibits etc. as they pertain to Highclere, that you have written about on your blog . For example, will a tour of the castle include, the Egyptian finds, the silver, the gorgeous library or will one have to chose between tours? In addition, is there a day versus an evening tour? My husband and I visited Highclere last summer. Yes, you can see all of the rooms you mention. There is an extra charge to see the Egyptian finds, and we chose not to, so I can't speak to that. The grounds are lovely and you can stroll around those without paying an admission fee. I'm sorry, but I don't remember the cost. I believe if you go to their website, you can see when it is open to the public. Our party will be so happy for the winner knowing what a great time will be had by the lucky and blessed 8! We are so excited for the announcement!!!!! We know it had to be a touch decision!!! In the end we are all winners for getting to participate!!! We had such a marvelous, magical time during our party. I am sure all the participants felt the exact same way. Thank you for the inspiration for the party and the opportunity to compete. There were amazing entries and in the end tears! I will share on Thursday. After some long and difficult deliberations from our judges Lady Carnarvon, Karine Hagen from Viking Cruises and Andrew McKenzie from The Vineyard we are now able to reveal the Grand Prize Winner of our Come and Dine competition. Tressa Lemky from Winnipeg, Canada went above and beyond everything we could possibly expect – hosting an amazing dinner party for family and friends, cooking some wonderful food from Lady Carnarvon’s book ‘At Home at Highclere’ and bringing her community together in support of ‘Working Together to End Human Trafficking’ an initiative started by the Joy Smith Foundation. Tressa is a very worthy winner and we are so pleased to able to invite her and seven guests to Come and Dine at Highclere Castle. Despite all of the other amazing entries, Tressa’s creativity and dedication stood out and I’m sure you will all agree that she deserves this fantastic, once in a lifetime opportunity to dine at Highclere Castle. Congratulations go to all entrants including our three runners up; Gary La Liberte from Quebec, Cherie Gould from Scottsdale, Arizona and Jennifer Haselgrove from Indooroopilly, Australia. Congratulations to all who competed and particularly to Tressa. Beautifully done. A tough decision but a very worthy winner! What a truly heartwarming video and grand announcement. Many congratulations to Ms. Lemky on such a spectacular dinner party, Highclere-and-Downton style, and to your touching reaction to her entry (and hers, to your call). That she would support PBS and especially a charity to end human trafficking is extraordinary. What a beautiful opportunity she will have to come and dine at your breathtaking home and to enjoy the other extraordinary sites of England. Thank you for what you personally are doing to support Public television, beauty, and civility. We too had Downtown Dress-Up dinners here in Saint Louis, Missouri,, albeit perhaps with a less noble purpose than raising money for charity and yet, to gather good friends and family for a gracious repast, delightful conversation, and watching one of the loveliest offerings television audiences have ever enjoyed does have its unique place in fostering goodwill and graciousness. What you provided via opening your exquisite home to television viewers around the world, indeed provided a unique opportunity for fostering a special camaraderie and wonderful memories that she shall never forget. Just in the past two weeks, we've dusted off our Downton videos and are enjoying the series all over again, albeit with less fanfare and just with our little immediate family. And it's a joy. I may be enjoying it more a second time, catching some conversation and nuances I'd missed midst all the "oohing and ahing" over Matthew Crawley and Branson! Thank you for all you do, and again, congratulations from America to our lucky Canadian friend! Thank you for being so happy for me being chosen -you are most gracious. I am so excited!! Yes we will! It is extraordinary. Congratulations I must say what a beautiful table the food must of been amazing aswell. I can add to the wonderfulness of that soup. The best soup I think I've ever tasted. A fairy tale ending for Tressa and friends, congratulations! Thank you so much Heather and yes you are correct- a fairy tale ending for sure....feeling so blessed. Congratulations to Tressa! Thanks for sharing the video of your call to her. I'd love to see the video of her dinner party. Thanks again for inspiring us to invite our friends in and host a special evening for them! What an amazing event and congratulations to Tressa. It was also fabulous to see an Aussie runner up. It really was a truly international competition and Jennifer's attention to detail was remarkable! How exciting for Tressa and her friends!!! Congrats Tressa! We are excited to see her video and share in following her trip to see you!!! I love her heart for the cause she chose and what a well deserved blessing for her hard work! So much fun and so happy for their trip to come!!! It was such a pleasure to speak to her on the phone and you can probably tell it brought a tear to my eye! Well done everyone and congratulations to all who entered. Reaching out to help do good deeds is never a bad thing. Just imagine all the people that will benefit from this competition. Mind blowing. Such fun while trying to make a difference in today's world! Very well organized event and many congratulations to all participants whose efforts have made us aware of the willingness to bless others in this endeavor. Hopefully this can be an annual event! Thank you for sharing. Just the few pictures of the table service and the beautiful dining room make me excited to watch the video that you will be sharing of Tressa's event. I think you have more than fulfilled a bucket-list life experience for her and her friends/family that will be travelling over to Come and Dine with you at Highclere. Thank you for coordinating and sponsoring such a worthwhile and beneficial event. It was such a pleasure to follow along as you posted through all the phases of Come and Dine. Congratulations to Tressa, I'm sure she is beyond excited. Congratulations to the runner ups too in Quebec and Australia .Cherie Gould in Scottsdale Arizona ,I live in Phoenix, Arizona, I know Tressa and guests will have a fabulous time at Highclere. So incredibly exciting!!! I am very happy for fellow-Canadian Tressa and her friends. What an incredible dream come true! I had tears in my eyes watching that call! Congratulations to Ms Lemkey and her friends. Amazing to see all the entrants listed at the end of the video. I counted fifty! No wonder it was so very difficult to choose. And thanks to you, Lady Carnarvon for putting together this wonderful event. You have caused much good in the fund-raising aspect of this and the fact that we eight here and the other entrants have a great topic of conversation for a long time to come! We are over the moon with excitement for you and your guests! Sincerely, from our hearts to yours! Oh my - thank you so much Cherie! You are so kind and encouraging. We are so excited and can hardly wait to fly to England! Congratulations to your group as well on being a top entry!! Herzliche Glückwünsche aus Berlin Germany Ich freue mich schon auf die Bilder. Tressa, Congratulations!!! How wonderful that a fellow 'Canadian' has won the honour! I can only imagine how very difficult a decision it must have been to choose a winner from all the incredible entrants - can't wait to see the video, and enjoy your trip to Highclere for all of us, eh! Very, very happy for you!!! Congratulations to Tressa and all of her friends! What a wonderful way to announce this!! I have tears in my eyes just listening to her excitement!!! I can imagine she is totally overwhelmed. I know I would be. You do these things and never expect you will actually be chosen!!! Oh, well done, Teresa and Lady Carnarvon. 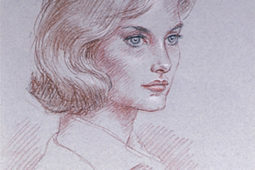 I will eagerly be watching to see her and her friends entertained at Highclere. And well done to everyone else who entered. This has been such fun to watch from afar. Blessings on all of you!! Thank you so much for your sweet words. I never dreamed I would win and to hear Lady Carnarvon ask me that question still brings tears to my eyes every time I think about it. Thank you so much for sharing in my excitement. I still can hardly believe it! Congratulations to Tressa and her friends , and we were moved to tears seeing the video with the personal phone call announcement! How wonderful Tressa must feel! And I know she will have a most special visit to Highclere Castle. It is special that she is from Canada, and that she contributes to the cause for End Human Trafficking, she is surely a super winner. Congratulations to the runner ups, and all the participants, we are all winners as it was a most splendid event...and a dinner idea that calls for repetition. I, too, am planning another "formal dinner" for the Royal Wedding on May 19th! "Synhariteria" to all! You were a wonderful runner up and I have a few trophies to send you!!! How exciting to see a fellow Canadian as grand prize winner :) I have been eagerly following the competition and I look forward to seeing the winning video! Tressa, I'm sure your adventure will be everything you desire....and undoubtedly more. I am heading to England this weekend and was fortunate enough to get tickets to the castle next week. I know I am beside myself with excitement and am sure you and your friends will be too. Congratulations on your amazing win. You are so sweet to be excited for me. I really appreciate your words of kindness. I am feeling so in awe of his and can hardly grasp it all! I have chills. Congratulations to Tressa on a beautiful event. The table, flowers, and centerpiece are extraordinary. I am looking forward to seeing the video if it is presented. How very exciting, and congratulations, as well, to you, Lady Carnarvon. The realization of your idea from concept to finish has been great fun to follow, and the donation to a deserving charity makes it complete. Thank you for more wonderful reading. In my book, you're all winners who sent in their entries and had their lovely parties and supported charities. Also congratulations, Cherie Gould (Go USA)! Congratulations to Tressa! The table was exquisite, and your devotion to the non-profit causes is truly commendable! I raise a glass to you! My family and I were thrilled to see that we were recognized as "Honorable Mention"! We truly enjoyed the experience. It will be something that we will all remember for the rest of our lives. Thank you Lady Carnarvon for this amazing opportunity! God's blessings on you and your family. Congratulations to Tressa Lemky and her friends! Such an exciting contest to win, and worldwide, no less! Well deserved for all your hard work and passion put into this endeavor! Thankyou for putting Winnipeg on the map! My sincere congratulations on this exciting win! Bravo! Cant wait to view the video! Congratulations Tressa!! What a beautiful table you set and what an honorable cause you represent. I know you'll enjoy your time at Highclere, and will raise awareness of the Joy Smith Foundation at the same time. I'm so excited for you!! You are so precious and I just love that the Lord has us meet that special day! I pray you are well and still smiling your beautiful smile!!! Geesh! Wish this was me! I did not enter, but maybe next time! I just want to publicly thank you for this incredible, once-in-a-lifetime opportunity. I am deeply humbled and feeling overwhelmed with joy and gratitude. I can still hardly believe this is real! I also want to thank the Lord for how He helped me during this entire process. To realize now that with His help it all came together is deeply moving. I am just in awe of this final outcome! I really never believed that I would win so I promised myself weeks ago that I would continue to be grateful for all that I had learned and experienced during the process. I was thrilled to be able to raise funds for our local PBS affiliate- Prairie Public and also draw attention to the reality of human trafficking within Canada through the Joy Smith Foundation. THANK YOU to all of you who have taken the time to post such kind and congratulatory comments....they have all brought me to tears. WOW - is all I can say - How Wonderful!!!! Can't wait to see the video - and more from Tressa's visit - I was in tears listening to the call - Well Done!!! Sincere congratulations to all of our Come and Dine comrades! What a fun event! We will be celebrating the royal wedding as well but we will be doing it with the masses in Windsor. Ms. Markle is an alumna of my university so we must go and cheer her on. We are coming to London for the Chelsea Flower Show Gala Preview Dinner so we could not help but book a weekend stay in Windsor at such an exciting and historic time. Cheers to everyone and "bon voyage" to Tressa. Congratulations to all the winners. Looking at the the photos from Tressa's dinner, it is easy to see why she won. Everything was just beautiful!! Human Trafficking is should a horrible stain on humanity and I am so happy that Tressa helped to shed light on the problem. Will we hear from Tressa about her experience, perhaps in a guest post on your blog, Lady Carnarvon? To Cherie Gloud representing the USA, huge congrats. I feel like I have been following your progress from the outset because you have posted here on Lady Carnarvon's Blog little snippets and insights of how you were faring and it was a pleasure to follow. Way to go Arizona!!! To all the other winners, heartiest congrats and well done! Congratulations to Tressa and all the worthy competitors who worked so hard. What a terrific event. I hope to see more in the future. How fun for everyone! Missed the last opportuntiy to participate in the Downtown Abbey Valentine Dinner Party. When will you be having another contest, I would be the first to enter. congratulations to all of you. It was a nice challenge and we enjoyed it a lot. I wish everybody a great springtime and this event will definitely walk into our box of memories. A nice story to tell. You have inspired me to entertain my friends and family after viewing your 'Tea Party" at your church and a very inspiring "Come & Dine" dinner party. I admire you raising awareness and donating funds to help stop human trafficking, a most important important cause. Thank you for the opportunity to enter this lovely contest. I so enjoyed having my friends and family and it was such a fun gathering!!! We all congratulate Tressa and the three very worthy runners up. I am delighted for the winners and hope they enjoy their wonderful prize. (prizes). A wonderful contest and so much fun, even if my party were not the winners. Happy Easter and Spring to all. I am having my family over for Easter brunch today, as my sister and family were visiting Chicago and my brother in laws family on Easter. Another party to look forward to, and I won't be sad about losing the contest and neither should anyone else, as it seemed like there were many impressive entries. You were all so amazing - I found it such an experience from just an idea. The dinner parties were beautiful. Karine (Hagen) was also just so moved - and in tears! We had such a wonderful time participating in your Come and Dine Competition. Gerald and I are thrilled for Tressa's win (congratulations Tressa!) and loved her beautifully polished video. I'd love to thank you, Karine Hagen, and Andrew McKenzie for giving me a runner up placement in the final judging. It was so exciting to receive the email Thursday morning from the Highclere Offices. I hope you consider repeating your competition in the future, so many more Downton Abbey fans can enjoy participating while helping worthy causes. It was such a pleasure to stretch my imagination, fuelled by your wonderful blog postings, and create our Titanic-themed dining room fit for the Crawley family ... And such fun it was executing it while raising funds for PBS. Thank you again, it's been an exciting week here in Quebec, Canada! Congratulations to the winner! So deserved! Enjoy your Highclere experience! Wishing I was one of your group of seven! Cheers! Tressa... So excited for you! I'm so glad you told me to listen to this, when we talked at my church (Faith Alive - Saskatoon)...you will have the time of your life!!!!! God go before you and I pray you fulfill His purpose for this trip! Have fun and think of all us Downton fans who are green with jealousy! LOL!!! Beautiful table - chandelier - crystal china and silver!!! Ooooh it makes my mouth water. Simply stunning! You are so right, Lady Carnarvon! Ms. Lemky's video and her lovely presence, along with the stunning ambience that she created say it all. What I love is how your beautiful blog and the peak into your gracious life was the inspiration for this elegant Canadian lady to create her own beauty of version for her friends. The variety of artistic, inspirational possibilities is endless. Ms. Lemky, you've combined beauty with meaning. That is ultimately where it should lead--just like the worthy charities which Lady Carnarvon supports. I've been so blessed today and inspired to think of ways in which I can emulate your example here in America. Thank you. I can't think of a more deserving winner. Congratulations! Oh, yes, hands-down this is the winner! Congratulations to Tressa and her friends for a most beautiful dinner, and also church tea. I am enthralled with the candles from Tressa's daughter's wedding, and also those beautiful tall fern holders? How elegant! 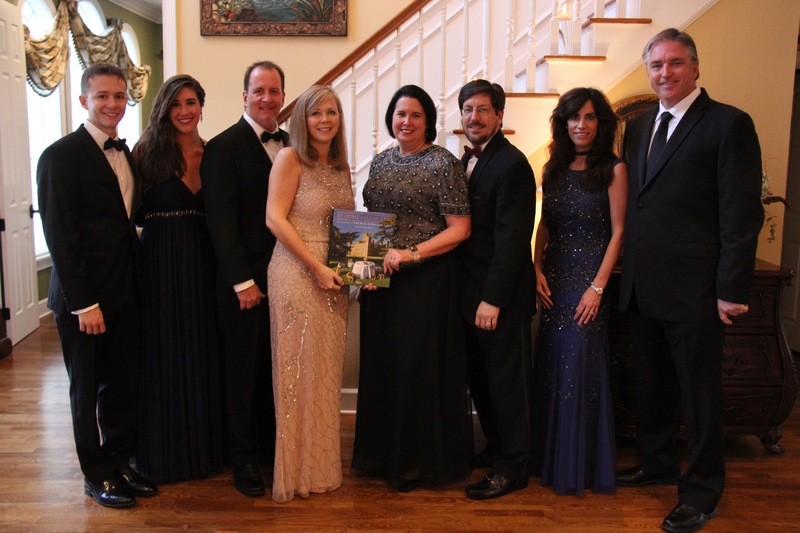 Lady Carnarvon's "Come and Dine" event was truly inspirational for all! Thank you, Lady C., for posting this video and making us feel "at home" in Winnepeg! Lady Carnarvon: I love reading your Blogs. The April Fool's Blog was the best! I made your Berry Crumble Recipe for our family's St. Patrick's Day Dinner, and everyone loved it! You mentioned having a Recipe Book you wrote. How can I get one? I thought I detected a British accent when I left a message on your phone. I'm from Grimsby in Lincolnshire .i left you my phone number too. I live in a town of 938 people. Just recently 3 lawyers were arrested in our area for Human Trafficking....If it can happen here it can happen anywhere! An excellent choice! Tressa's inclusion of a worthy cause and a beautiful evening shared with others at an elegant table and with delicious food was inspiring. Well done and enjoy your time in England! Congratulations !! You deserve it !! Enjoy your time in a "real" castle !!!! Beautiful work Tressa! I love those crystal Palms! It's great seeing you again in the video, and I'll never forget what an inspiration you were to my friend August and I when we met at Highclere. I hope circumstances bring us together again in the future, and I'm so glad that you and your church are ever increasing awareness of the scourge of human trafficking. And of course what would we do without PBS? You, my dear, are a dear blessing! Thank you as well Lady Carnarvon for your bright, creative, and welcoming spirit! You bring joy to all you encounter! Congratulations, Tessa! Well done, indeed! I can tell you are used to entertaining. Very elegant. You deserve the grand prize! Enjoy your time at the Castle! Can't wait to see the grand event. Have you ever been on Good Morning America, Today Show, or any of the big show in USA? This segment seems like it'd fit right in . . . .
Congratulations. To use an overused sports idiom: "you hit this one out of the park." ( I take it that you have some knowledge of this idiom as baseball is played in Canada.) But I digress. I was truly touched by your video for many reasons. The first was that your faith and your church family was your anchor. Second, that you went beyond just raising funds for PBS but you reached out to a most deserving charity, one which to me speaks to your strong faith which encourages us to always help those in need. How delightful in every aspect! Couldn't have been made better. I watched it twice and stopped the video so I could study everything Tressa had chosen and accomplished. The church's "tea room" was beautiful and way beyond what the usual "fellowship halls" are here in the USA. This was well done and presented with excellence. Thank you for sharing this inspirational and very deserving winning entry, Lady Carnarvon. Thanks for sharing Tressa's winning video - She totally deserved to win! Just loved everything on that beautiful table. Got to get out the silver polish and get to work - Always great to raise money and awareness for great causes. Our Womens Club here in Napa, CA also does the "opportunity drawings" like Tressa did at her tea - Wonderful way to raise money for the women and children in our community and bring awareness to the human trafficking. We also had a group of people arrested in our own area - so sad that it is a huge problem worldwide - but with everyone working hard we can all make a difference. 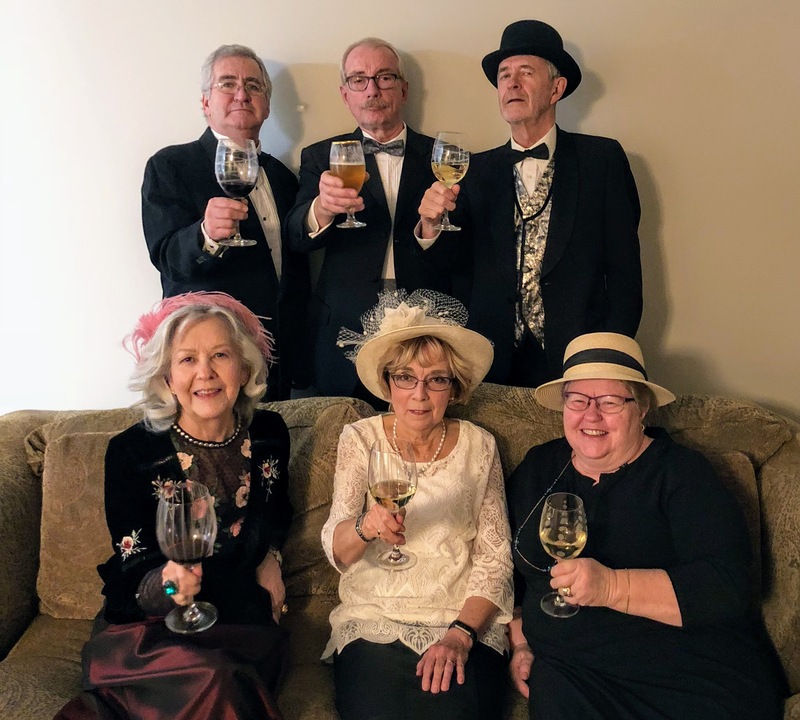 Beautifully presented, highly entertaining and uplifting and informative on the fine art of living at all times, the Canadian winner's magnificent dinner party is a grand gesture and a tribute. Thank you for sharing these beautiful events and details. Tressa you are such a deserving winner....your presentation was awe inspiring, beautiful and gracious. Enjoy your journey to England and time with Lady Carnarvan. Tressa, everything was wonderful! The food was expertly presented, and, I am sure, tasted wonderful! (Since I review restaurants for a living, I know a little about that. ) :) The presentation on trafficking was amazing. (One of my nieces worked for an organization that raised awareness for trafficking, so it is close to my heart as well.) Your table was exquisite and your guests looked so regal! Wonderful job - the video was very moving. God bless. Congratulations! In the words of Isobel Crawley...BRAVA! You are an inspiration to soo many. I wish I could have been in the running and had a dinner party of my own. I'm currently caring for my 88 year-old mother with dementia 24/7. A visit to Highclere Castle is on my bucket list! Enjoy your momential visit to "Downton Abbey"! Congratulations, Tressa!! What a beautiful table, and how appropriate that your grandmother's silverware is called "Coronation" by Oneida. Thank you for the update. We're looking forward to the video.......almost like being there!